본 발명은 높은 아크릴아미드 단량체 함량, 및 수분 함량 간의 탁월한 균형을 갖는 투명한 실리콘 하이드로젤을 제공한다. The present invention provides a transparent silicone hydrogel having an excellent balance between high acrylamide monomer content, and water content. 실리콘 하이드로젤은 복수의 단량체를 함유하는 단량체 믹스를 중합하여 얻어질 수 있으며, 단량체 믹스는 약 30 내지 약 98 중량%의 적어도 하나의 유형의 실리콘 단량체, 및 약 1 내지 약 50 중량%의, 분자 내에 적어도 2개의 하이드록실기를 함유하는 적어도 하나의 유형의 비-실리콘 유형 (메트)아크릴아미드 단량체를 포함하며; Silicone hydrogel is obtainable by polymerizing a monomer mix containing a plurality of monomers, the monomer mix from about 30 to at least one type of the silicon monomer of about 98% by weight, and from about 1 to about 50% by weight, the molecular at least the at least one type of which contains two hydroxyl groups in a non-silicon-type (meth) acrylamide monomers include; 중량%는 단량체 믹스 중 단량체 성분 및 중합체 성분의 총량을 기준으로 한다. Weight percents being based on the total amount of the monomer components and the polymer component of the monomer mix. 본 출원은 2011년 3월 15일자로 출원된 미국 특허 출원 제13/048,252호 및 2010년 3월 18일자로 출원된 일본 특허 출원 제2010-061991호의 우선권을 주장한다. This application claims priority to US Patent Application of No. 13 / 048,252 calls and Japanese Patent Application No. 2010-061991, filed on March 18, 2010. Filed on March 15th 2011. 본 발명은 실리콘 하이드로젤에 관한 것이다. The present invention relates to a silicone hydrogel. 이러한 실리콘 하이드로젤은 안과용 렌즈, 내시경, 카테터, 수액 튜브(transfusion tube), 기체 수송 튜브, 스텐트, 시스(sheath), 커프(cuff), 튜브 커넥터, 엑세스 포트, 배액 주머니(drainage bag), 혈액 회로(blood circuit), 상처 피복 재료, 및 다양한 유형의 약제 담체와 같은 의료 용구에 사용하기에 적합하나, 콘택트 렌즈, 안과용 렌즈, 및 인공 각막을 위해 특히 적합하다. These silicone hydrogel ophthalmic lenses, endoscope, catheter, infusion tube (transfusion tube), the gas transport tube, a stent, a sheath (sheath), the cuff (cuff), tube connector, the access port, a drainage bag (drainage bag) for blood circuit (blood circuit), is particularly suitable for the wound covering material, and one suitable for use in medical devices such as various types of pharmaceutical carrier, contact lenses, ophthalmic lenses, and artificial corneas. 최근에, 실리콘 하이드로젤이 장기간의 착용을 위해 사용되는 콘택트 렌즈를 위한 재료로서 알려지게 되었다. In recent years, it has come to be known as a material for the silicone hydrogel contact lenses that are used for long-term wear. 실리콘 하이드로젤은 적어도 하나의 실리콘 성분과 적어도 하나의 친수성 성분을 조합하여 얻는다. Silicone hydrogel is obtained by combining at least one hydrophilic component and at least one of the silicon component. 예를 들어, 미국 특허 제7396890호 및 제7214809호는, 실리콘 (메트)아크릴아미드 단량체와, N,N-다이메틸아크릴아미드와 같은 친수성 아크릴아미드 단량체, 2-하이드록시에틸 메타크릴레이트와 같은 친수성 메타크릴레이트 에스테르를 포함할 수 있는 친수성 성분과, 내부 습윤제를 함유하는 중합 믹스를 중합하여 얻어지는 실리콘 하이드로젤을 개시한다. For example, the hydrophilic, such as U.S. Patent No. 7.39689 million and No. 7,214,809 discloses a silicon (meth) acrylamide monomer and, N, N- dimethyl-acrylamide hydrophilic monomers such as acrylamide, 2-hydroxyethyl methacrylate hydrophilic component, which may include a methacrylate ester and, by polymerizing a polymerizable mix containing an internal wetting agent discloses a silicone hydrogel is obtained. 그러나, 이러한 조성은 비교적 많은 양의 메타크릴레이트 에스테르를 가질 수 있다. However, such a composition may have a relatively large amount of methacrylate ester. 아크릴아미드 단량체는 단일중합 시 메타크릴레이트 에스테르보다 더 큰 중합 속도 상수를 갖지만, 아크릴아미드 및 메타크릴레이트 공중합의 속도는 상당히 더 낮으며 결과적으로 계 전체의 중합 속도가 감소될 것이다. Acrylamide monomers will be more gatjiman the large polymerization rate constant, the speed of acrylamide and methacrylate copolymer is considerably low and as a result, the entire system of the polymerization rate decreased more methacrylate esters during a single polymerization. 다른 한편, 미국 특허 제4711943호 및 일본 특허 출원 공개 H10-212355호는 실리콘 아크릴아미드 단량체 및 친수성 아크릴아미드 단량체를 함유하는 실리콘 하이드로젤을 개시한다. On the other hand, U.S. Patent No. 4,711,943, and Japanese Patent Application Publication H10-212355 discloses a silicone hydrogel containing the silicone acrylate monomer and hydrophilic acrylate monomer. 아크릴아미드 단량체가 이러한 조성의 대부분을 차지하며, 계 전체에 대해 더 높은 중합 속도가 예상된다. The acrylamide monomer accounts for most of these compositions, and the higher the polymerization rate is expected for the entire system. 그러나, 아크릴아미드기의 아미도 결합은 높은 친수성을 가지며, 따라서, 바람직한 산소 투과성을 제공하기에 충분한 양의 실리콘 성분, 및 렌즈에 가요성을 제공하기에 충분한 수분 함량을 제공하는 둘 모두를 달성하는 관점에서 투명한 렌즈를 제공하는 것이 어렵다는 문제가 있다. However, the amido bond of the acrylic amide has a high hydrophilicity, and therefore, a sufficient amount of the silicon component, and to achieve both, to provide a sufficient moisture content to provide a go into the lens to provide the desired oxygen permeability there is a problem that it is difficult to provide a clear lens in perspective. 특히, 표면의 습윤성을 증가시키기 위해 내부 습윤제가 첨가되는 경우에 투명한 렌즈를 달성하는 것이 특히 어렵다. In particular, it is especially difficult to achieve a transparent lens in the case where the internal wetting agent is added in order to increase the wettability of the surface. 다른 한편, 문헌[Andre Laschewsky et al., Macromol. On the other hand, the literature [Laschewsky Andre et al., Macromol. Chem. Chem. Phys. Phys. 2001, 202, 276 286]은 하나의 분자 내에 적어도 2개의 하이드록실기를 갖는 친수성 아크릴아미드 단량체를 사용하는 중합체를 개시한다. 2001, 202, 276 286] discloses a polymer using a hydrophilic acrylic monomer having at least two hydroxyl groups in one molecule. 그러나, 실리콘 단량체와의 공중합도, 공중합체의 투명성 및 기타 물리적 특성도 개시되어 있지 않다. However, also copolymers of the silicon monomer, is not even disclosed in transparency and other physical properties of the copolymer. 본 발명은 아크릴아미드 단량체 함량이 높으며, 수분 함량, 모듈러스, 습윤성 및 투명성 사이의 균형이 탁월한 실리콘 하이드로젤에 관한 것이다. The present invention is highly acrylamide monomer content, the balance between water content, modulus, wettability and transparency relate to excellent silicone hydrogel. 이러한 실리콘 하이드로젤은 다양한 유형의 의료 기구, 특히 안과용 렌즈, 예를 들어, 콘택트 렌즈, 안내 렌즈, 및 인공 각막을 위해, 특히 콘택트 렌즈를 위해 적합하게 사용된다. These silicone hydrogels are the various types of medical devices, lenses, especially for ophthalmic For example, for contact lenses, intraocular lenses, and artificial corneas, and particularly suitably used for contact lenses. ii) R 14 및 R 15 중 나머지 하나는 적어도 2개의 하이드록실기로 치환됨]로 나타내어지는 적어도 하나의 비-실리콘 (메트)아크릴아미드 단량체를 함유하는, 실리콘 하이드로젤. , silicone hydrogels containing silicone (meth) acrylamide monomer - ii) R 14 and R 15 of the other is at least one non-expressed with at least two substituted by one hydroxyl group. 본 발명은 또한 콘택트 렌즈, 인공 각막, 내시경, 카테터, 수액 튜브, 기체 수송 튜브, 스텐트, 시스, 커브, 튜브 커넥터, 액세스 포트, 배액 주머니, 혈액 회로, 상처 피복 재료, 및 약제 담체를 포함하는, 상기한 실리콘 하이드로젤로부터 제조된 의료 기구에 관한 것이다. The present invention also provides contact lenses, artificial cornea, endoscope, catheter, infusion tube, a gas transport tube, a stent, a sheath, a curve, a tube connector, the access port, a drainage bag, blood circuit, a wound coating material, and comprising a medicament carrier, It relates to a medical device made from the silicone hydrogels. 본 발명은 또한 아크릴아미드 단량체 함량이 높고, 수분 함량, 모듈러스, 습윤성 및 투명성 사이의 균형이 탁월한 실리콘 하이드로젤에 관한 것이다. The present invention also provides a high acrylamide monomer content, the balance between water content, modulus, wettability and transparency relate to excellent silicone hydrogel. 이러한 실리콘 하이드로젤은 다양한 유형의 의료 용구, 특히 안과용 렌즈, 예를 들어, 콘택트 렌즈, 안내 렌즈, 및 인공 각막을 위해, 특히 콘택트 렌즈를 위해 적합하게 사용된다. These silicone hydrogels are the various types of medical devices, lenses, especially for ophthalmic For example, for contact lenses, intraocular lenses, and artificial corneas, and particularly suitably used for contact lenses. 본 명세서에 사용되는 바와 같이, 용어 (메트) 또는 (메틸)은 선택적인 메틸 치환을 나타낸다. As used herein, the term (meth) or (methyl) represents the optional methyl substitution. 따라서, "(메트)아크릴레이트"와 같은 용어는 메타크릴 및 아크릴 라디칼 둘 모두를 나타낸다. Thus, "(meth) acrylate" and like terms denotes both methacrylic and acrylic radicals. (B) 단량체 성분 및 중합체 성분의 총량에 대해 1 내지 50 중량%의, 분자 내에 적어도 2개의 하이드록실기를 갖는 비-실리콘 (메트)아크릴아미드 단량체를 포함하는 단량체 믹스를 중합하여 얻는다. It is obtained by polymerizing a monomer mix comprising a silicon (meth) acrylamide monomers - (B) a monomer component and a polymer component at least two hydroxy groups in non-lock having a 1 to 50% by weight, on the total amount of the molecule. 본 발명에서, 실리콘 단량체는 중합성 기 및 실록사닐기를 포함하는 단량체를 지칭한다. 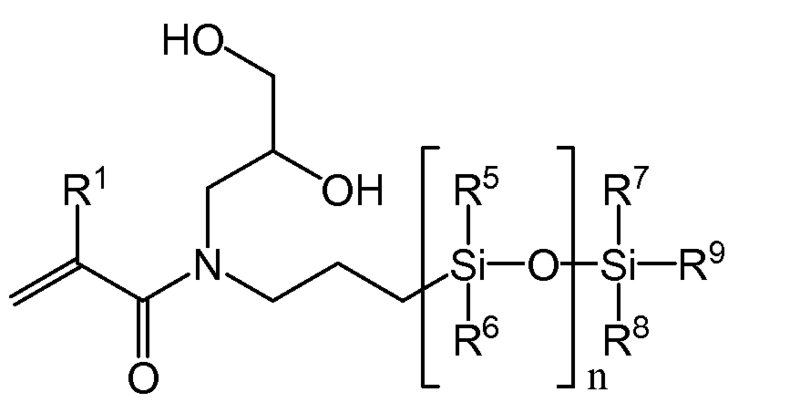 In the present invention, the silicon monomer refers to a monomer comprising a polymerizable group and a siloxane sanil. 실록사닐기는 적어도 하나의 Si-O-Si 결합을 갖는 기를 지칭한다. 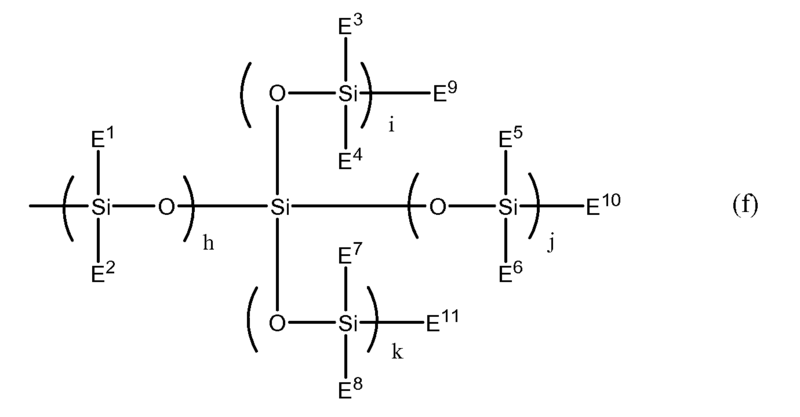 Sanil siloxane groups refers to a group having at least one Si-O-Si bond. 본 발명의 실리콘 하이드로젤에 사용되는 실리콘 단량체의 예는 하기 화학식 a1 내지 a4로 표시되는 실리콘 단량체이다. 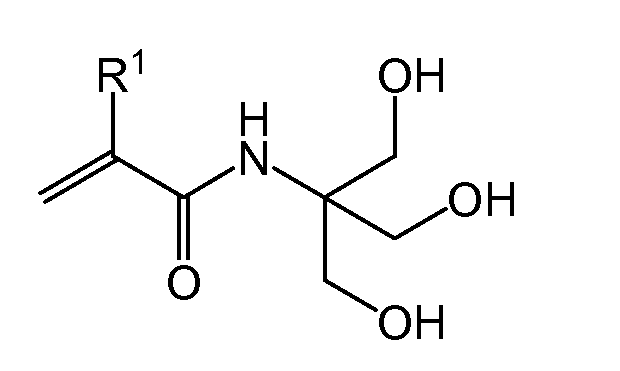 Examples of the silicone monomer used in the silicone hydrogels of the present invention is a silicone monomer represented by the formula a1 to a4 to. 화학식 a1 내지 a4에서, R 1 은 독립적으로 수소 원자 또는 메틸기를 나타낸다. In formula a1 to a4, R 1 is independently a hydrogen atom or a methyl group. 중합 속도를 추가로 증가시키기 위해서, 이들 중 수소 원자가 바람직하다. In order to increase further the rate of polymerization, is preferably a hydrogen atom of the above. R 2 는 1 내지 20개의 탄소 원자, 일부 실시 형태에서 1 내지 10개의 탄소 원자, 및 다른 실시 형태에서 1 내지 6개의 탄소 원자를 갖는 알킬기를 나타내며, 그 중 임의의 것이 적어도 하나의 하이드록실기로 치환된다. R 2 is a 1 to 20 carbon atoms, some embodiments from 1 to 10 carbon atoms in, and in another embodiment, represents an alkyl group having 1 to 6 carbon atoms, any of it at least one of the hydroxyl groups of which It is substituted. 예에는 2-하이드록시에틸기, 2-하이드록시프로필기, 3-하이드록시프로필기, 2,3-다이하이드록시프로필기, 4-하이드록시 부틸기, 2-하이드록시-1,1-비스(하이드록시메틸) 에틸기, 2-하이드록시메틸페닐기, 3-하이드록시메틸페닐기, 4-하이드록시메틸페닐기 등이 포함된다. Examples include 2-hydroxy ethyl, 2-hydroxy propyl, 3-hydroxypropyl group, a 2,3-hydroxypropyl group, a 4-hydroxybutyl group, a 2-hydroxy-1,1-bis ( hydroxymethyl) ethyl group, and the like 2-hydroxy-2-methylphenyl group, 3-hydroxy-methylphenyl, 4-hydroxy-phenyl group. 일 실시 형태에서, R 2 는 2-하이드록시에틸기, 2-하이드록시프로필기 및 2,3-다이하이드록시프로필기로부터 선택되며, 다른 실시 형태에서 R 2 는 2,3-다이하이드록시프로필기이다. In one embodiment, R 2 is 2-hydroxy ethyl, 2-hydroxypropyl group, and a 2,3-dihydroxy is selected from propyl, R 2 In another embodiment 2,3-hydroxy-propyl to be. R 3 은, 비치환될 수 있거나 또는 독립적으로 하이드록실, 산, 에스테르, 에테르, 티올 및 이들의 조합과 같은 치환 기를 가질 수 있는, 1 내지 20개의 탄소 원자를 갖는 알킬렌기 또는 6 내지 20개의 탄소 원자를 갖는 아릴렌기를 나타낸다. R 3 is a beach may be unsubstituted, or independently represent a hydroxyl, an acid, an ester, an ether, a thiol and an alkyl group or a 6 to 20 carbons having from 1 to 20 carbon atoms, which may have a substituted, such as a combination of both It represents an arylene group having atoms. 일 실시 형태에서, R 3 은, 비치환될 수 있거나 또는 독립적으로 하이드록실, 산, 에스테르, 에테르, 티올 및 이들의 조합으로 치환될 수 있는 C1-10 알킬렌을 나타낸다. In one embodiment, R 3 shows a C1-10 alkylene which may be substituted with beach may be unsubstituted, or independently represent a hydroxyl, an acid, ester, ether, thiol, and combinations thereof. 그 예에는 메틸렌기, 에틸렌기, 프로필렌기, 부틸렌기, 펜탈렌기, 옥탈렌기, 데실렌기, 및 등이 포함된다. Examples include methylene, ethylene, propylene, butylene, pental group, octal group, a group having xylene, and the like. 이러한 알킬렌기 및 아릴렌기는 직선형 또는 분지형일 수 있다. The alkylene group and the arylene group may be of straight or branched. 다른 실시 형태에서, R 2 는, 비치환될 수 있거나 또는 하이드록실기, 에테르기 및 이들의 조합으로 치환될 수 있는 C 1 -5 알킬렌기 로부터 선택된다. In another embodiment, R 2 is selected from the beach may be either ring or a hydroxyl group, an ether group and a C 1 -5 alkyl group which may be substituted with a combination of the two. 다른 실시 형태에서, R 2 는, 비치환될 수 있거나 또는 하이드록실기, 에테르기 및 이들의 조합으로 치환될 수 있는 C 2 -5 알킬렌기로부터 선택되며, 또 다른 실시 형태에서, R 2 는, 비치환될 수 있거나 또는 하이드록실기, 에테르기 및 이들의 조합으로 치환될 수 있는 C 3 알킬렌기이다. In another embodiment, R 2 is is selected from C 2 -5 alkyl group which may be substituted with a beach may be unsubstituted, or a hydroxyl group, an ether group, and combinations thereof, In another embodiment, R 2 is, Beach a ring or may be a hydroxyl group, an ether group and a C 3 alkylene group which may be substituted with a combination of the two. R 4 는 수소 원자, 또는 하이드록실, 산, 에스테르, 에테르, 티올 및 이들의 조합으로 치환될 수 있는 1 내지 20개의 탄소 원자를 갖는 알킬 또는 아릴기를 나타낸다. R 4 represents an alkyl or aryl group having from 1 to 20 carbon atoms which may be substituted with a hydrogen atom, or hydroxyl, acid, ester, ether, thiol, and combinations thereof. 그 예에는 수소 원자, 메틸기, 에틸기, 프로필기, n-프로필기, i-프로필기, n-부틸기, s-부틸기, t-부틸기, n-펜틸기, i-펜틸기, s-펜틸기, 네오펜틸기, 헥실기, 헵틸기, 옥틸기, 노닐기, 데실기, 도데실기, 에이코실기, 페닐기, 나프틸기 등이 포함된다. Examples include hydrogen atom, methyl group, ethyl group, propyl group, n- propyl, i- propyl, n- butyl, s- butyl, t- butyl, n- pentyl, i- pentyl, s- pentyl group, neopentyl group, hexyl group, heptyl group, octyl group, include nonyl, decyl group, dodecyl group, eicosyl group, a phenyl group, a naphthyl group or the like. 이러한 알킬기는 직선형 또는 분지형일 수 있다. These groups may be of straight or branched. R 4 중의 탄소 원자의 개수가 너무 많은 경우에는, 실리콘 함량이 상대적으로 낮을 것이므로, 수소 원자, 또는 1 내지 10개의 탄소 원자를 갖는 알킬 또는 아릴기가 더욱 바람직하며, 수소 원자, 또는 1 내지 4개의 탄소 원자를 갖는 알킬기가 가장 바람직하다. In R 4, the case of a too large number of carbon atoms, the silicon content is relatively because it is low, the hydrogen atom, or 1 more preferably an alkyl or aryl group having one to ten carbon atoms group and a hydrogen atom, or 1 to 4 carbon an alkyl group having atoms are most preferred. 화학식 f에서, E 1 내지 E 11 은 독립적으로 수소 원자, 임의의 것이 불소, 하이드록실, 산, 에스테르, 에테르, 티올 및 이들의 조합으로 치환될 수 있는 1 내지 20개의 탄소 원자, 일부 실시 형태에서, 1 내지 10개의 탄소 원자, 다른 실시 형태에서 1 내지 6개의 탄소 원자를 갖는 알킬기, 또는 불소, 하이드록실, 산, 에스테르, 에테르, 티올 및 이들의 조합으로 치환될 수 있는 6 내지 20개의 탄소 원자를 갖는 아릴기를 나타낸다. In the formula f, E 1 to E 11 are independently a hydrogen atom, any is fluorine, hydroxyl, acid, ester, ether, thiol, and 1 to 20 carbon atoms, which may be substituted with a combination thereof In some embodiments , from 1 to 10 carbon atoms, an alkyl group having 1 to 6 carbon atoms in another embodiment, or fluorine, hydroxyl, acid, ester, ether, thiol, and 6 to 20 carbon atoms which may be substituted with a combination of a represents an aryl group having. 화학식 f에서, h는 0 내지 200의 정수를 나타내고, i, j, 및 k는 독립적으로 0 내지 20의 정수를 나타낸다(h = i = j = k = 0인 경우는 제외함). In the formula f, h is an integer of 0 to 200, i, j, and k are independently an integer of 0 to 20 (except for the case of h = i = j = k = 0). h + i + j + k의 총합이 너무 작은 경우에는, 충분한 산소 투과성이 달성되지 않을 것이나, 너무 큰 경우에는, 친수성 단량체와의 상용성(compatibility)이 감소될 것이다. If the sum of h + i + j + k is too small, it would not have sufficient oxygen permeability is not achieved, there will be too large, decrease in compatibility (compatibility) with the hydrophilic monomer. 그러므로, 총합은 2 내지 100이 바람직하고, 2 내지10이 더욱 바람직하고, 3 내지 10이 가장 바람직하다. Therefore, the sum is from 2 to 100 is preferred, and, and more preferably from 2 to 10 and most preferably from 3 to 10. 게다가, 얻어지는 실리콘 예비중합체를 중합하여 얻어지는 중합체의 형상 회복성의 관점에서 i = j = k = 0이 바람직하다. In addition, the i = j = k = 0 is preferable in view of shape recovery castle polymer obtained by polymerizing the silicone prepolymer is obtained. 전술한 것 중, 화학식 a1 및 a2에 의해 표시되는 실리콘 (메트)아크릴아미드 단량체가 계 전체의 중합 속도를 증가시키는 관점에서 바람직하다. Of that described above, it is preferred from the viewpoint of the silicone (meth) acrylamide monomer represented by formula a1 and a2 increases the overall polymerization rate of the system. 화학식 a1 및 a2에 의해 표시되는 실리콘 (메트)아크릴아미드 단량체의 구조의 더욱 특별한 예는 하기 화학식 b1 내지 b4로 표시되는 실리콘 (메트)아크릴아미드 단량체이다. 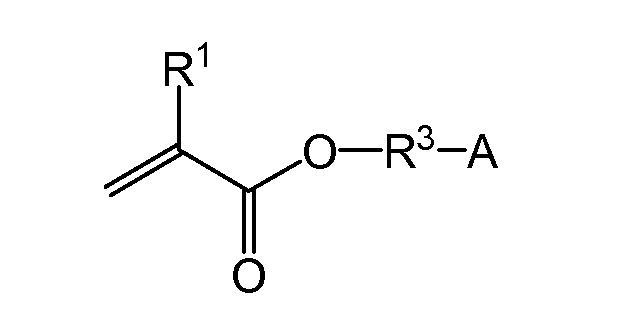 A more particular example of the structure of the silicone (meth) acrylamide monomer represented by formula a1 and a2 is a silicon (meth) acrylamide monomer represented by the following formula b1 to b4. 화학식 b1 내지 b4에서, R 1 은 독립적으로 수소 원자 또는 메틸기를 나타낸다. In formula b1 to b4, R 1 is independently a hydrogen atom or a methyl group. 그 중에서, 중합 속도를 증가시키는 관점에서 수소 원자가 더욱 바람직하다. Among them, hydrogen atom is more preferred from the viewpoint of increasing the polymerization rate. R 5 내지 R 13 은 독립적으로 1 내지 20개의 탄소 원자를 갖는 알킬기 또는 6 내지 20개의 탄소 원자를 갖는 아릴기를 나타낸다. R 5 to R 13 are an aryl group having independently from 1 to 20 alkyl group, or a 6 to 20 carbon atoms having a carbon atom. R 5 내지 R 8 의 탄소 원자의 개수가 너무 많은 경우에는, 규소 원자 함량이 상대적으로 낮을 것이며, 이는 실리콘 하이드로젤의 산소 투과성의 감소를 가져온다. R is too large number of carbon atoms of R 5 to 8, the silicon atom content will be relatively low, which results in a reduction in the oxygen permeability of silicone hydrogels. 그러므로, 1 내지 10개의 탄소 원자를 갖는 알킬기 또는 6 내지 10개의 탄소 원자를 갖는 아릴기가 더욱 바람직하고, 1 내지 4개의 탄소 원자를 갖는 알킬기가 더욱 더 바람직하고, 1개의 탄소 원자를 갖는 메틸기가 가장 바람직하다. Therefore, 1 to 10 carbon atoms and the aryl group is more preferably has an alkyl group or a 6 to 10 carbon atoms having 1 to 4 alkyl groups having carbon atoms and even more preferably, a methyl group having one carbon atom to the desirable. R 9 중의 탄소 원자의 개수가 너무 적은 경우에는, 폴리실록산 사슬이 쉽게 가수분해될 것이나, 너무 높은 경우에는, 실록산 하이드로젤이 더 낮은 산소 투과성을 갖는 경향이 있을 것이다. R 9 in the case a too small number of carbon atoms, the polysiloxane chain would be easily hydrolyzed, there will be too high if there, tend siloxane hydrogel having a lower oxygen permeability. 그러므로, 1 내지 10개의 탄소 원자를 갖는 알킬기 또는 6 내지 10개의 탄소 원자를 갖는 아릴기가 더욱 바람직하고, 1 내지 6개의 탄소 원자를 갖는 알킬기가 더욱 더 바람직하고, 1 내지 4개의 탄소 원자를 갖는 알킬기가 가장 바람직하다. Therefore, 1 to 10 having a carbon atom having an alkyl group or 6 to 10 carbon atoms, an aryl group and more preferably, one to six alkyl groups having carbon atoms more preferable, and an alkyl group having 1 to 4 carbon atoms it is most preferred. R 9 내지 R 13 중의 탄소 원자의 개수가 너무 많은 경우에는, 실리콘 하이드로젤의 산소 투과성이 너무 낮을 것이며, 따라서, 1 내지 10개의 탄소 원자를 갖는 알킬기 또는 6 내지 10개의 탄소 원자를 갖는 아릴기가 더욱 바람직하고, 1 내지 4 개의 탄소 원자를 갖는 알킬기가 더욱 더 바람직하고, 메틸기 또는 에틸기가 가장 바람직하다. R 9 to R 13, if in a too large number of carbon atoms, is based on a very low oxygen permeability of silicone hydrogels, therefore, from 1 to 10 carbon atoms, a has an alkyl group or a 6 to 10 carbon atoms, the aryl group further having preferred, from 1 to 4 carbon atom alkyl group is still more preferably has, and is a methyl group or an ethyl group most preferred. n은 1 내지 50 범위의 자연수이다. n is a natural number ranging from 1 to 50. n이 너무 작은 경우에는, 충분한 산소 투과성이 달성되지 않을 것이나, 너무 큰 경우에는, 친수성 단량체와의 상용성이 감소될 것이다. When n is too small, it would not have sufficient oxygen permeability be achieved, if too large, would reduce the compatibility with a hydrophilic monomer. 그러므로, 이 값은 2 내지 30이 바람직하고, 3 내지 10이 더욱 바람직하고, 3 내지 10이 가장 바람직하다. Therefore, this value is 2 to 30 are preferred, and 3 to 10, and even more preferably and most preferably from 3 to 10.
m은 0 내지 2의 자연수를 나타낸다. m represents a natural number of 0-2. 충분한 산소 투과성을 얻기 위해서 m은 더욱 바람직하게는 0 또는 1이다. In order to achieve sufficient oxygen permeability and m is more preferably 0 or 1. 화학식 b1 내지 b4로 표시되는 실리콘 (메트)아크릴아미드 단량체 중에서, 실록사닐기가 직쇄이기 때문에, 얻어지는 실리콘 하이드로젤의 형상 회복성이 양호할 것이라는 관점에서 화학식 b1 및 b2로 표시되는 실리콘 (메트)아크릴아미드 단량체가 바람직하며, 얻어지는 실리콘 하이드로젤의 투명성의 관점에서 화학식 b2로 표시되는 실리콘 (메트)아크릴아미드 단량체가 가장 바람직하다. From silicone (meth) acrylamide monomer represented by the following formula b1 to b4, Annals sanil group is a straight-chain is due, silicon (meth) acrylamide represented in perspective the shape recovery of the silicone hydrogel is obtained will be as good as the formula b1 and b2 monomers are preferred, and most preferably a silicone (meth) acrylamide monomer represented by the formula b2 from the viewpoint of transparency of the silicone hydrogel is obtained. 본 발명의 실리콘 하이드로젤에 사용되는 실리콘 단량체의 양이 너무 적은 경우에는, 실리콘 하이드로젤의 산소 투과성이 불충분할 것이나, 양이 너무 많은 경우에는, 친수성이 불충분할 것이어서, 단량체 믹스 중 단량체 및 중합체 성분은 30 내지 98 중량%, 바람직하게는 40 내지 80 중량%, 및 더욱 바람직하게는 50 내지 70 중량%이어야 한다. When the amount of silicon monomer used in the silicone hydrogels of the present invention too small, would be the oxygen permeability of silicone hydrogels is insufficient, when the too large amount, geotyieoseo to hydrophilicity is insufficient, the monomer mix of monomer and polymer components 30 to 98% by weight, preferably to be 40 to 80% by weight, and more preferably from 50 to 70% by weight. 하한 값은 바람직하게는 30 중량%, 더욱 바람직하게는 40 중량%, 그리고 더욱 더 바람직하게는 50 중량%이다. The lower limit value is preferably 30% by weight, more preferably 40% by weight, and still more preferably 50% by weight. 상한 값은 바람직하게는 98 중량%, 더욱 바람직하게는 80 중량%, 더욱 더 바람직하게는 70 중량%이다. The upper limit value is preferably 98% by weight, more preferably 80% by weight, even more preferably 70% by weight. 임의의 바람직한 하한 값 및 임의의 바람직한 상한 값이 함께 조합될 수 있다. Any desirable lower value and any desirable upper limit value may be combined together. 화학식 c0에서, R 1 은 수소 또는 메틸이다. In formula c0, R 1 is hydrogen or methyl. R 14 및 R 15 중 적어도 하나는 적어도 하나의 하이드록실기로 치환된 적어도 C1-C20 알킬로 치환되되, 단, i) R 14 및 R 15 중 하나가 수소인 경우에, ii) R 14 및 R 15 중 나머지 하나는 적어도 2개의 하이드록실기로 치환된 C1-C20 알킬기이고, 본 명세서에 기록된 중량%는 단량체 믹스 중 단량체 성분 및 중합체 성분의 총량을 기준으로 한다. R 14 and R 15 at least one of which is in the case where at least one hydroxyl doedoe substituted with at least a C1-C20 alkyl substituted with a hydroxyl group, provided that, i) R 14 and R 15 either are hydrogen, ii) R 14 and R the rest of the 15th one, at least 2, and a C1-C20 alkyl group substituted with one hydroxyl group, the weight percent recorded in this specification being based on the total amount of the monomer components and the polymer component of the monomer mix. 부수적으로, 본 발명에서, 비-실리콘 (메트)아크릴아미드 단량체는 분자 내에 실록사닐기를 함유하지 않는 (메트)아크릴아미드 단량체를 지칭한다. Incidentally, in the present invention, the non-silicone (meth) acrylic monomer refers to a (meth) acrylate monomer does not contain siloxane groups in the molecule sanil. 일 실시 형태에서, 비-실리콘 (메트)아크릴아미드 단량체는 분자 내에 적어도 2개의 하이드록실기를 포함한다. 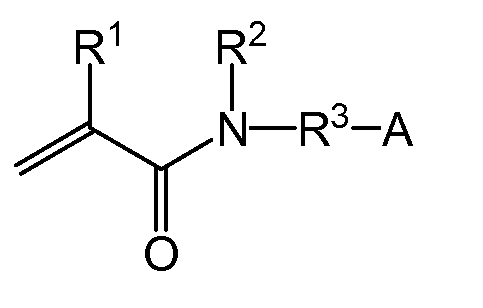 In one embodiment, the non-silicone (meth) acrylate monomer comprises at least two hydroxyl groups in the molecule. 이러한 실시 형태의 화학식 c0에서, R 1 은 수소 또는 메틸기를 나타낸다. In formula c0 of such embodiments, R 1 is a hydrogen or a methyl group. 일부 실시 형태에서, 중합 속도를 증가시키는 관점에서 수소 원자가 더욱 바람직하다. In some embodiments, it is more preferably a hydrogen atom from the viewpoint of increasing the polymerization rate. 이러한 실시 형태에서 R 14 및 R 15 중 적어도 하나는 수소, 선택적으로 치환된 C1-C20 알킬기, 또는 선택적으로 치환된 C6-C20 아릴기로부터 선택되되, 단, R 14 및 R 15 중의 하이드록실기의 총 개수는 2개 이상이다. At least one of R 14 and R 15 in this embodiment is a hydrogen, doedoe optionally selected from a C1-C20 alkyl group, or an optionally substituted C6-C20 aryl group, provided, R 14 and R 15 of the hydroxyl groups the total number is more than two. 일 실시 형태에서, 비-실리콘 (메트)아크릴아미드가 상기 조건을 충족시키기만 한다면, R 14 및 R 15 는 독립적으로, 적어도 하나 이상의 하이드록실기로 치환될 수 있는 C1-C10 알킬기, 다른 실시 형태에서 적어도 하나 이상의 하이드록실기로 치환될 수 있는 C1-C6 알킬기로부터 선택된다. In one embodiment, the non-long as the silicone (meth) acrylamide to satisfy the condition, R 14 and R 15 are independently, C1-C10 alkyl group optionally substituted with at least one hydroxyl group, in another embodiment with at least one hydroxyl group is selected from C1-C6 alkyl group optionally substituted with from. R 14 및 R 15 의 예에는 수소 원자, 메틸기, 에틸기, 프로필기, n-프로필기, i-프로필기, n-부틸기, s-부틸기, t-부틸기, n-펜틸기, i-펜틸기, s-펜틸기, 네오펜틸기, 헥실기, 헵틸기, 옥틸기, 노닐기, 데실기, 도데실기, 에이코실기, 페닐기, 나프틸기, 2-하이드록시에틸기, 2-하이드록시프로필기, 3-하이드록시프로필기, 2,3-다이하이드록시프로필기, 4-하이드록시 부틸기, 2-하이드록시-1,1-비스(하이드록시메틸) 에틸기, 2-하이드록시메틸페닐기, 3-하이드록시메틸페닐기, 4-하이드록시메틸페닐기 등이 포함된다. R 14, and examples of R 15 include hydrogen atom, methyl group, ethyl group, propyl group, n- propyl, i- propyl, n- butyl, s- butyl, t- butyl, n- pentyl, i- pentyl group, a s- pentyl group, neopentyl group, hexyl group, heptyl group, octyl group, nonyl group, decyl group, dodecyl group, eicosyl group, a phenyl group, a naphthyl group, 2-hydroxy ethyl, 2-hydroxy-propyl , 3-hydroxypropyl group, a 2,3-hydroxypropyl group, a 4-hydroxybutyl group, a 2-hydroxy-1,1-bis (hydroxymethyl) ethyl, 2-hydroxy-2-methylphenyl group, 3 -, and the like hydroxy-methylphenyl, 4-hydroxy-phenyl group. 이러한 알킬기 및 하이드록시알킬기는 직선형 또는 분지형일 수 있다. These alkyl group and a hydroxy group may be of straight or branched. 분자 내에 적어도 2개의 하이드록실기를 함유하는 비-실리콘 유형 (메트)아크릴아미드 단량체의 특히 바람직한 예에는 하기 화학식 c1 내지 c3으로 표시되는 단량체가 포함된다. 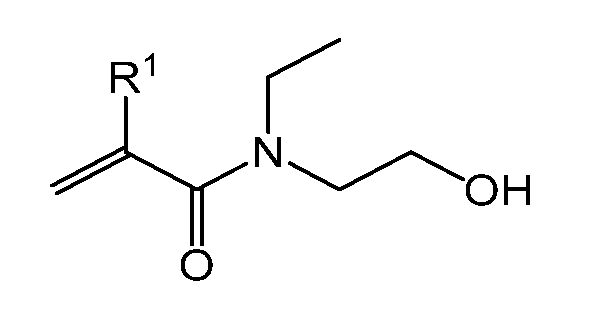 At least two non-hydroxy containing hydroxyl groups in the molecule to have a particularly preferred example of the silicone type (meth) acrylamide monomers include monomers represented by the formula c1 to c3. 화학식 c1 내지 c3에서, R 1 은 독립적으로 수소 원자 또는 메틸기를 나타낸다. In the formula c1 to c3, R 1 is independently a hydrogen atom or a methyl group. 일부 실시 형태에서, 중합 속도를 증가시키는 관점에서 수소 원자가 더욱 바람직하다. In some embodiments, it is more preferably a hydrogen atom from the viewpoint of increasing the polymerization rate. 더욱이, 이들 단량체 중에서, 화학식 c1로 표시되는 단량체는 본 발명의 실시예에 사용된 다른 성분들과 중합 시에 탁월한 투명도를 갖는 콘택트 렌즈를 생성하였다. Further, among these monomers, monomers represented by the formula c1 was produced contact lenses having excellent transparency at the time of the other ingredients and polymerization using an embodiment of the present invention. 다른 실시 형태에서, 비-실리콘 (메트)아크릴아미드 단량체는 분자 내에 하나의 하이드록실기를 포함하며 아미드 수소를 포함하지 않는다. 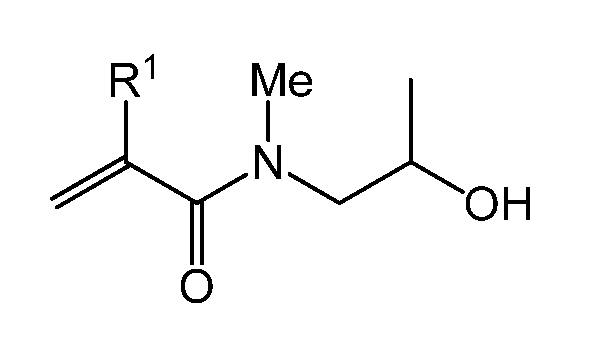 In another embodiment, the non-silicone (meth) acrylamide monomer including a hydroxyl group in the molecule, and does not include an amide hydrogen. 이러한 실시 형태의 화학식 c0에서, R 1 은 수소 또는 메틸기를 나타낸다. In formula c0 of such embodiments, R 1 is a hydrogen or a methyl group. 일부 실시 형태에서, 중합 속도를 증가시키는 관점에서 수소 원자가 더욱 바람직하다. In some embodiments, it is more preferably a hydrogen atom from the viewpoint of increasing the polymerization rate. 바람직하게는 R 14 및 R 15 는 독립적으로, 선택적으로 치환된 C1-C20 알킬기, 또는 선택적으로 치환된 C6-C20 아릴기로부터 선택되되, 단, R 14 및 R 15 중 하나는 적어도 하나의 하이드록실기로 치환된다. Preferably R 14 and R 15 are, each independently, doedoe optionally selected from a C1-C20 alkyl group, or an optionally substituted C6-C20 aryl group, provided, R 14 and R 15 one of which at least one hydroxyl It is replaced by a group. R 14 및 R 15 의 예에는 메틸기, 에틸기, 프로필기, n-프로필기, i-프로필기, n-부틸기, s-부틸기, t-부틸기, n-펜틸기, i-펜틸기, s-펜틸기, 네오펜틸기, 헥실기, 헵틸기, 옥틸기, 노닐기, 데실기, 도데실기, 에이코실기, 페닐기, 나프틸기, 2-하이드록시에틸기, 2-하이드록시프로필기, 3-하이드록시프로필기, 4-하이드록시 부틸기, 2-하이드록시메틸페닐기, 3-하이드록시메틸페닐기, 4-하이드록시메틸페닐기 등이 포함된다. Examples of R 14 and R 15 include methyl group, ethyl group, propyl group, n- propyl, i- propyl, n- butyl, s- butyl, t- butyl, n- pentyl, i- pentyl, s- pentyl group, neopentyl group, hexyl group, heptyl group, octyl group, nonyl group, decyl group, dodecyl group, eicosyl group, a phenyl group, a naphthyl group, 2-hydroxy ethyl, 2-hydroxypropyl group, 3- hydroxy propyl, and the like 4-hydroxybutyl group, a 2-hydroxy-2-methylphenyl group, 3-hydroxy-methylphenyl, 4-hydroxy-phenyl group. 이러한 알킬기는 직선형 또는 분지형일 수 있다. These groups may be of straight or branched. 분자 내에 하이드록실기를 가지며 아미드 수소를 갖지 않는 비-실리콘 (메트)아크릴아미드 단량체의 예에는 하기 화학식 c11 내지 c13으로 표시되는 단량체가 포함된다. 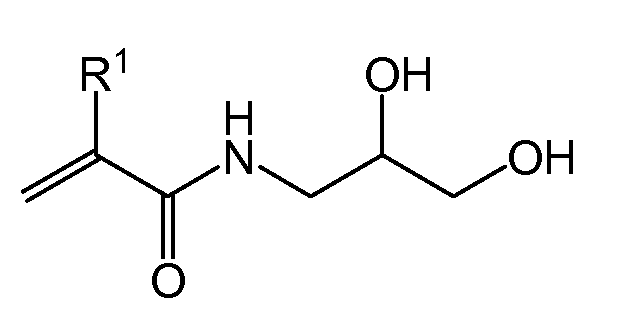 A hydroxyl group having a ratio which does not have the amide hydrogen in the molecule Examples of silicone (meth) acrylamide monomers include monomers represented by the formula c11 to c13 to. 화학식 c11 내지 c13에서, R 1 은 독립적으로 수소 원자 또는 메틸기를 나타낸다. In formula c11 to c13, R 1 is independently a hydrogen atom or a methyl group. 일부 실시 형태에서, 중합 속도를 증가시키는 관점에서 수소 원자가 더욱 바람직하다. In some embodiments, it is more preferably a hydrogen atom from the viewpoint of increasing the polymerization rate. 더욱이, 이들 단량체 중에서는, 얻어지는 실리콘 하이드로젤의 투명성의 관점에서 화학식 c11로 표시되는 단량체가 가장 바람직하다. Moreover, these monomers in, it is most preferable that the monomer represented by the general formula c11 from the viewpoint of transparency of the silicone hydrogel is obtained. 얻어지는 실리콘 하이드로젤의 낮은 모듈러스의 관점에서, 분자 내에 하나의 하이드록실기 및 하나의 아미드 수소를 포함하는 아크릴아미드 단량체가 바람직하다. 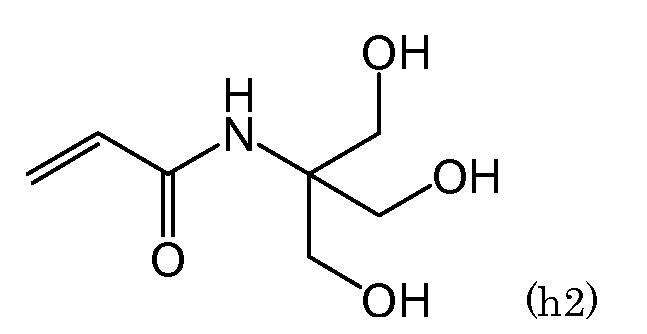 In view of the low modulus of the silicone hydrogel is obtained, an acrylic monomer containing one hydroxyl group and one amide hydrogen in the molecule are preferred. 분자 내에 하나의 하이드록실기 및 하나의 아미드 수소를 포함하는 아크릴아미드 단량체의 예에는 N-(모노-하이드록실 치환된 C1-C20 알킬)아크릴아미드 및 N-(모노-하이드록실 치환된 C6-C20 아릴)아크릴아미드가 포함된다. 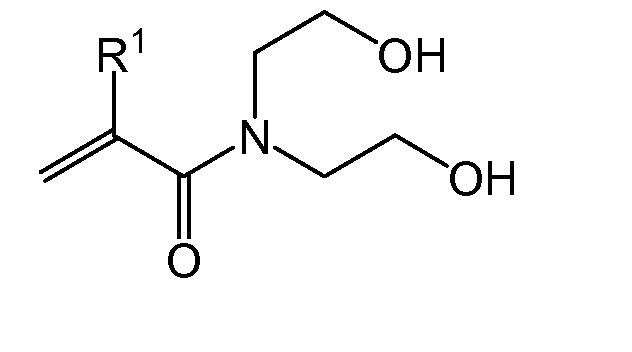 Examples of the acrylic monomer containing one hydroxyl group and one amide hydrogen in the molecule is N- (mono-hydroxyl-substituted C1-C20 alkyl) acrylamide and N- (mono-hydroxyl-substituted C6-C20 aryl) include acrylamide. 더욱 구체적인 예에는 N-(2-하이드록시에틸)아크릴아미드, N-(2-하이드록시프로필)아크릴아미드, N-(3-하이드록시프로필)아크릴아미드, N-(2-하이드록시부틸)아크릴아미드, N-(3-하이드록시부틸)아크릴아미드, N-(4-하이드록시 부틸)아크릴아미드, N-(2-하이드록시메틸페닐)아크릴아미드, N-(3-하이드록시메틸페닐)아크릴아미드, N-(4-하이드록시메틸페닐)아크릴아미드 등이 포함된다. More specific examples include N- (2- hydroxyethyl) acrylamide, N- (2- hydroxypropyl) acrylamide, N- (3- hydroxypropyl) acrylamide, N- (2- hydroxy-butyl) acrylate amide, N- (3- hydroxybutyl) acrylamide, N- (4- hydroxybutyl) acrylamide, N- (2- hydroxy-phenyl) acrylamide, N- (3- hydroxy-phenyl) acrylamide, N-, and the like (4-hydroxy-phenyl) acrylamide. 이러한 알킬기 및 아릴기는 직선형 또는 분지형일 수 있다. These alkyl group and aryl group may be of straight or branched. 얻어지는 실리콘 하이드로젤의 낮은 모듈러스의 관점에서, N-(모노-하이드록실 치환된 C2-C4 알킬)아크릴아미드가 더욱 바람직하며, N-(2-하이드록시에틸)아크릴아미드가 가장 바람직하다. In view of the low modulus of the silicone hydrogel obtained, N- (mono-hydroxyl-substituted C2-C4 alkyl), and more preferably acrylamide, N- (2- hydroxyethyl) acrylamide is most preferred. 비-실리콘 (메트)아크릴아미드 단량체의 양이 너무 적은 경우에는, 실리콘 하이드로젤이 낮은 투명성 또는 높은 모듈러스 또는 둘 모두를 가질 것이나, 양이 너무 많은 경우에는, 실리콘 하이드로젤이 낮은 산소 투과성을 가질 것이므로, 양은 단량체 믹스 중 단량체 및 중합체 성분을 기준으로 1 내지 50 중량%, 일부 실시 형태에서 2 내지 30 중량%, 다른 실시 형태에서 3 내지 20 중량%, 및 다른 실시 형태에서, 약 5 내지 약 15 중량%이다. Non-silicone (meth) When the amount of the acrylic monomer is too small, it would have both a silicone hydrogel with low transparency and high modulus, or both, when the too large amount, a silicone hydrogel is because it have a low oxygen permeability , the amount, based on the monomer and the polymer components in the monomer mix from 1 to 50% by weight, in some embodiments, 2 to 30% by weight, 3 to 20% by weight in another embodiment, and other embodiments, from about 5 to about 15 wt. %to be. 적합한 하한 값은 약 1 중량%, 약 2 중량%, 약 3 중량%, 및 약 5 중량%를 포함한다. Suitable lower limits are from about 1% by weight, about 2%, about 3% by weight, and about 5% by weight. 적합한 상한 값은 약 50 중량%, 약 30 중량%, 약 20 중량%, 및 약 15 중량%를 포함한다. Suitable upper limit value and a about 50%, about 30%, about 20% by weight, and about 15% by weight. 임의의 바람직한 하한 값 및 임의의 바람직한 상한 값이 함께 조합될 수 있다. Any desirable lower value and any desirable upper limit value may be combined together. 본 발명의 실리콘 하이드로젤을 얻기 위한 단량체 믹스는 또한 반응성 및 비-반응성 습윤제를 함유할 수 있다. Monomer mix to obtain a silicone hydrogel of the present invention is also reactive and non-reactive and may contain a wetting agent. 적합한 습윤제에는 분자량이 약 1000 이상인 친수성 중합체가 포함된다. Suitable wetting agents include hydrophilic polymers having a molecular weight less than about 1000. 친수성 중합체는 단량체 성분 및 중합체 성분의 총량에 대해 약 1 내지 약 30 중량%의 양으로 단량체 믹스에 포함될 수 있다. The hydrophilic polymer may be included in the monomer mix in an amount of from about 1 to about 30 wt.% Based on the total amount of the monomer component and the polymer component. 본 발명의 실리콘 하이드로젤에 사용될 수 있는 친수성 중합체의 예에는 폴리-N-비닐 피롤리돈, 폴리-N-비닐-2-피페리돈, 폴리-N-비닐-2-카프로락탐, 폴리-N-비닐-3-메틸-2-카프로락탐, 폴리-N-비닐-3-메틸-2-피페리돈, 폴리-N-비닐-4-메틸-2-피페리돈, 폴리-N-비닐-4-메틸-2-카프로락탐, 폴리-N-비닐-3-에틸-2-피롤리돈, 폴리-N-비닐-4,5-다이메틸-2-피롤리돈, 폴리비닐 이미다졸, 폴리-N-비닐 포름아미드, 폴리-N-비닐 (메틸)아세트아미드, 폴리-N-메틸-N-비닐 (메틸)아세트아미드, 폴리-N-비닐-N-(메틸)프로피온아미드, 폴리-N-비닐-N-메틸-2-(메틸)프로피온아미드, 폴리-N-비닐-2-(메틸)프로피온아미드, 폴리-N-비닐-N,N'-다이메틸우레아 폴리-N,N-다이메틸 아크릴아미드, 폴리-N,N-다이에틸 아크릴아미드, 폴리-N-아이소프로필 아크릴아미드, 폴리비닐 알코올, 폴리아크릴레이트, 폴 Examples of hydrophilic polymers that can be used in the silicone hydrogel of this invention include poly -N- vinylpyrrolidone, poly -N- vinyl-2-piperidone, poly -N- vinyl-2-caprolactam, poly -N- vinyl-3-methyl-2-caprolactam, poly -N- vinyl-3-methyl-2-piperidone, poly-4-vinyl -N- methyl-2-piperidone, poly-vinyl-4-methyl -N- 2-caprolactam, poly -N- vinyl-3-ethyl-2-pyrrolidone, poly -N- vinyl-4,5-dimethyl-2-pyrrolidone, polyvinyl imidazole, poly -N- vinylformamide, poly vinyl -N- (methyl) acetamide, poly -N- methyl vinyl -N- (methyl) acetamide, poly vinyl -N- -N- (methyl) propionamide, poly -N- vinyl- N- methyl-2- (methyl) propionamide, poly-vinyl-2 -N- (methyl) propionamide, poly vinyl -N- -N, N'- dimethyl-urea poly -N, N- dimethyl-acrylamide , poly -N, N- diethyl acrylamide, poly -N- isopropyl acrylamide, polyvinyl alcohol, polyacrylate, Paul 에틸렌 옥사이드, 폴리-2-에틸 옥사졸린, 헤파린, 다당류, 폴리-아크릴로일 모르폴린, 및 이들의 혼합물 및 공중합체가 포함된다. Ethylene oxide, poly-2-ethyl-oxazoline, heparin polysaccharides, poly- include acryloyl morpholine, and mixtures and copolymers. 폴리비닐피롤리돈, 폴리-N,N-다이메틸 아크릴아미드, 폴리아크릴산, 폴리비닐 알코올, 폴리-N-메틸-N-비닐 (메틸)아세트아미드 및 이들의 공중합체 및 혼합물로부터 선택되는 친수성 중합체가 소정 실리콘 하이드로젤의 습윤성을 향상시키는 데 특히 효과적일 수 있다. Polyvinyl pyrrolidone hydrophilic polymer is money, poly -N, selected from N- dimethyl acrylamide, polyacrylic acid, polyvinyl alcohol, vinyl -N- methyl -N- (methylsulfonyl) acetamide, and copolymers thereof and mixtures that can be particularly effective in improving the wettability of a given silicone hydrogel. 폴리비닐피롤리돈 및 폴리-N,N-다이메틸 아크릴아미드는 실리콘 하이드로젤의 습윤성과 소정 제형에서 단량체 믹스와의 상용성 사이의 균형을 제공한다. Polyvinylpyrrolidone and poly -N, N- dimethyl-acrylamide and provides a balance between the compatibility with the wettability of the silicone hydrogel monomer mix, and in certain formulations. 적합한 습윤제의 예는 미국 특허 출원 공개 제2006-0072069A1호, 미국 특허 제6367929호 및 미국 특허 출원 공개 제2008-0045612A1호에 개시되어 있다. Examples of suitable wetting agents are disclosed in U.S. Patent Application Publication No. 2006-0072069A1, U.S. Patent No. 6,367,929 and U.S. Patent Application Publication No. 2008-0045612A1. 본 발명의 실리콘 하이드로젤에 사용되는 친수성 중합체의 양이 너무 적은 경우에는, 원하는 습윤성이 달성되지 않을 수 있으나, 너무 많은 경우에는, 친수성 중합체가 단량체 믹스에 쉽게 용해되지 않을 수 있으므로, 양은 단량체 믹스 중 단량체 및 중합체 성분의 약 1 내지 약 30 중량%, 일부 실시 형태에서 약 2 내지 약 25 중량%, 다른 실시 형태에서 약 3 내지 약 20 중량%, 및 다른 실시 형태에서 약 6 내지 약 20 중량%이다. When the amount of the hydrophilic polymer used in the silicone hydrogel of this invention is too low, it desired, but the wettability can not be achieved, too many cases, since the hydrophilic polymer may not be readily soluble in the monomer mix, of the amount of monomer mix about 1 to about 30% by weight of the monomer and polymer component, from about 2 to about 25 weight percent in some embodiments, from about 3 to about 20% by weight in another embodiment, and in another embodiment from about 6 to about 20% by weight . 하한 값은 약 1 중량%, 약 2 중량%, 바람직하게는 약 3 중량%, 및 약 6 중량%를 포함한다. The lower limit value of from about 1% by weight, about 2% by weight, preferably from about 3% by weight, and about 6% by weight. 상한 값은 약 30 중량%, 약 25 중량%, 약 20 중량%, 약 9 중량%를 포함한다. The upper limit value includes about 30% by weight, about 25%, about 20% by weight, about 9% by weight. 임의의 하한 값 및 임의의 상한 값이 함께 조합될 수 있다. Any lower value and any upper limit may be combined together. 본 발명의 실리콘 하이드로젤에 사용되는 친수성 중합체의 분자량이 너무 작은 경우에는, 바람직한 습윤성이 제공되지 않을 수 있으나, 너무 큰 경우에는, 단량체 믹스에서의 용해도가 불량할 수 있고, 단량체 믹스의 점도가 증가할 것이다. In the case of the hydrophilic polymer used in the silicone hydrogels of the present invention the molecular weight is too small, preferred but wettability it may not be provided, so the case is large, and the solubility in the monomer mix may be poor, the viscosity of the monomer mix increased something to do. 일 실시 형태에서 분자량은 바람직하게는 1000 달톤 내지 1000만 달톤, 일부 실시 형태에서 100,000 달톤 내지 100만 달톤, 및 다른 실시 형태에서 200,000 내지 800,000이다. In one embodiment the molecular weight is preferably from 1000 daltons to 10 million daltons, and in some embodiments 100,000 Daltons to 1,000,000 Daltons, and 200,000 to 800,000 in another embodiment. 친수성 중합체가 실리콘 하이드로젤 매트릭스와 공유 결합가능한 적어도 하나의 반응성 기를 포함하는 실시 형태에서, 분자량은약 2000 달톤 이상, 약 5,000 달톤 이상; The hydrophilic polymer in an embodiment comprising a silicone hydrogel matrix covalently bonded to at least one reactive as possible, the molecular weight is at least about 2000 Daltons, at least about 5,000 daltons; 및 일부 실시 형태에서 약 5,000 내지 약 180,000 달톤, 또는 약 5,000 내지 약 150,000 달톤일 수 있다. And it may be in some embodiments about 5,000 to about 180,000 Daltons, or about 5,000 to about 150,000 daltons. 하한 값은 약 1000 달톤, 약 100,000 달톤, 및 약 200,000 달톤을 포함한다. The lower limit values ​​include about 1,000 daltons, about 100,000 daltons, and about 200,000 daltons. 상한 값은 약 1000만 달톤, 약 100만 달톤, 및 약 800,000 달톤을 포함한다. The upper limit values ​​include about 10 million Daltons, from about 1,000,000 Daltons and about 800,000 Daltons. 임의의 바람직한 하한 값 및 임의의 바람직한 상한 값이 함께 조합될 수 있다. Any desirable lower value and any desirable upper limit value may be combined together. 본 발명의 친수성 중합체의 분자량은 젤 투과 크로마토그래피(컬럼: 토소 코포레이션(Tosoh Corporation)에 의해 제조된 TSK 젤 GMPWXL, 이동상: 물/메탄올 = 50/50, 0.1 N 질산리튬 첨가, 유속: 0.5 mL/min, 검출기: 시차 굴절률 검출기, 분자량 표준 샘플: 폴리에틸렌 글리콜)에 의해 측정된 중량평균 분자량(Mw)으로 표시된다. The molecular weight of the hydrophilic polymer of the present invention is gel permeation chromatography (column: Toso Corporation (Tosoh Corporation) in a TSK GMPWXL gel, mobile phase prepared by: water / methanol = 50/50, 0.1 N lithium nitrate was added, flow rate: 0.5 mL / is represented by polyethylene glycol) of weight average molecular weight (Mw) as determined by: min, detector: differential refractive index detector, and the molecular weight standard sample. 일 실시 형태에서, 본 발명의 실리콘 하이드로젤을 얻기 위한 단량체 믹스는 바람직하게는 또한 하기 조건(D)을 충족한다. In one embodiment, the monomer mix to obtain a silicone hydrogel of the present invention should preferably also satisfy the following conditions (D). (D) 실리콘 단량체의 적어도 일부는 실리콘 (메트)아크릴아미드 단량체이고, 모든 (메트)아크릴아미드 단량체(실리콘 및 비-실리콘 (메트)아크릴아미드 단량체)의 총량은 단량체 믹스 중 단량체 성분의 총량에 대해 약 90 중량% 이상이다. (D) and at least a portion of the silicon monomer is a silicon (meth) acrylamide monomer, any (meth) acrylamide monomer - the total amount of the (silicone and non-silicone (meth) acrylic monomer) is the total amount of the monomer mix the monomer components at least about 90% by weight. 본 발명의 실리콘 하이드로젤을 중합하는 데 사용되는 단량체 성분 중에서, 비-아크릴아미드 단량체의 양이 너무 많은 경우에는, 전반적인 중합 속도가 감소될 것이므로, 모든 (메트)아크릴아미드 단량체 (실리콘 및 비-실리콘 (메트)아크릴아미드 단량체)의 총량은 일 실시 형태에서 약 90 중량% 이상, 다른 실시 형태에서, 약 95 중량% 이상이다. Among monomer components used to polymerize the silicone hydrogels of the present invention, the non-case, the amount of acrylamide monomer is too large, because it will be the overall polymerization rate decreased, any (meth) acrylamide monomer (silicon and non-silicon (meth) in another embodiment, the total amount is about 90% by weight or more, in one embodiment of the acrylamide monomers), is at least about 95% by weight. 본 발명의 실리콘 하이드로젤은, 분자 내에 적어도 2개의 하이드록실기를 함유하는 비-실리콘 유형 아크릴아미드 단량체에 더하여, 제2 비-실리콘 유형 아미드 단량체를 또한 함유할 수 있다. Silicone hydrogels of the present invention, at least two non-hydroxy containing hydroxyl groups in the molecule in addition to the silicone type, an acrylic monomer, the second non-silicon type may also contain a monomer. 그 예에는 (메트)아크릴아미드, N,N-다이메틸 (메트)아크릴아미드, N,N-다이에틸 (메트)아크릴아미드, N-아이소프로필 (메트)아크릴아미드, (메트)아크릴로일 모르폴린, N-메톡시메틸 (메트)아크릴아미드, N-하이드록시메틸 (메트)아크릴아미드, N-(2-하이드록시에틸) (메트)아크릴아미드 등이 포함된다. Examples include (meth) acrylamide, N, N- dimethyl (meth) acrylamide, N, N- diethyl (meth) acrylamide, N- isopropyl (meth) acrylamide, (meth) acrylic know morpholine, and the like N- methoxymethyl (meth) acrylamide, N- hydroxymethyl (meth) acrylamide, N- (2- hydroxyethyl) (meth) acrylamide. 이들 중에, 친수성과 실리콘 단량체와의 상용성 사이의 균형, 및 중합 속도의 관점에서 N,N-다이메틸아크릴아미드가 바람직하다. Of these, the N, N- dimethyl-acrylamide in view of the balance, and a polymerization rate between the compatibility with the hydrophilic monomer and the silicon are preferred. 사용되는 제2 비-실리콘 유형 (메트) 아크릴아미드 단량체의 양이 너무 많은 경우에는, 산소 투과성이 감소될 것이나, 너무 적은 경우에는, 실리콘 하이드로젤이 너무 경질일 것이므로, 이러한 실시 형태에서 제2 비-실리콘 유형 (메트)아크릴아미드 단량체의 양은 단량체 믹스 중 단량체 및 중합체 성분을 기준으로 약 1 내지 약 50 중량%, 더욱 바람직하게는 약 10 내지 약 40 중량%, 가장 바람직하게는 15 내지 35 중량%이다. The second non-used - when the amount of the silicone type (meth) acrylate monomer is too large, would be the oxygen permeability reducing, if too small, the silicone hydrogel is probably the too hard, and the second ratio in this embodiment silicon-type (meth) based on the monomer and polymer component of the amount of monomer mix of acrylamide monomer from about 1 to about 50% by weight, more preferably from about 10 to about 40% by weight, most preferably from 15 to 35% by weight to be. 하한 값은 약 1 중량%, 약 10 중량%, 및 약15 중량%이다. The lower limit value is about 1% by weight, about 10% by weight, and about 15% by weight. 상한 값은 약 50 중량%, 약 40 중량%, 및 약 35 중량%이다. The upper limit value is about 50%, about 40% by weight, and from about 35% by weight. 임의의 하한 값 및 임의의 상한 값이 함께 조합될 수 있다. Any lower value and any upper limit may be combined together. 본 발명의 실리콘 하이드로젤은 또한 2개 이상의 중합성 기를 갖는 단량체를 공중합 성분으로서 포함할 수 있다. Silicone hydrogels of the present invention can also comprise a monomer having two or more polymerizable as a copolymer component. 이러한 경우에, 본 발명의 실리콘 하이드로젤은 내용매성으로 된다. In this case, the silicone hydrogels of the present invention is a solvent resistance. 2개 이상의 중합성 기를 갖는 단량체의 바람직한 예에는 2작용성 및 다작용성 아크릴레이트, 예를 들어, 에틸렌 글리콜 (메트)아크릴레이트, 다이에틸렌 글리콜 다이(메트)아크릴레이트, 트라이에틸렌 글리콜 다이(메트)아크릴레이트, 네오펜틸 글리콜 다이(메트)아크릴레이트, 테트라에틸렌 글리콜 다이(메트)아크릴레이트, 글리세릴 트라이(메트)아크릴레이트, 펜타에리트리톨 테트라(메트)아크릴레이트, 및 트라이메틸올 프로판 트라이(메트)아크릴레이트, 및 비스아크릴아미드, 예를 들어, N,N'-메틸렌 비스아크릴아미드, N,N'-에틸렌 비스아크릴아미드, N,N'-프로필렌 비스아크릴아미드 등이 포함된다. 2, preferable examples include 2-functional and multi-functional acrylates, for example, ethylene glycol (meth) acrylate, diethylene glycol di (meth) acrylate, triethylene glycol di (meth) of monomers having one or more polymerizable acrylate, neopentyl glycol di (meth) acrylate, tetraethylene glycol di (meth) acrylate, glyceryl tri (meth) acrylate, pentaerythritol tetra (meth) acrylate, and trimethylolpropane tri (meth ) it includes the acrylate, and bis-acrylamides, e.g., N, N'- methylenebisacrylamide, N, N'- ethylene bis-acrylamide, N, N'- propylene bisacrylamide or the like. 그 중에서, 중합 속도 증가의 관점에서 비스아크릴아미드가 바람직하며, 그 중에서, N,N'-메틸렌 비스아크릴아미드 및 N,N'-에틸렌 비스아크릴아미드가 바람직하다. Among these, and the bisacrylamide preferable from the viewpoint of increasing the polymerization rate, in that, the N, N'- methylenebisacrylamide and N, N'- ethylene bis-acrylamide are preferred. 2개 이상의 중합성 기를 함유하는 단량체의 사용량은 약 0.1 내지 약 10 중량%, 일부 실시 형태에서 약 0.5 내지 약 8 중량%, 및 다른 실시 형태에서 약 0.8 내지 약 5 중량%이다. 2 The amount of monomers containing more than one polymerizable group is from about 0.1 to about 10% by weight, from about 0.5 to about 8% by weight in some embodiments, and in another embodiment from about 0.8 to about 5% by weight. 하한 값은 약 0.1 중량%, 약 0.5 중량%, 및 약 0.8 중량%를 포함한다. The lower limit value includes about 0.1%, about 0.5% by weight, and about 0.8% by weight. 상한 값은 약 10 중량%, 약 8 중량%, 및 약 5 중량%를 포함한다. The upper limit value is from about 10 wt%, about 8% by weight, and about 5% by weight. 임의의 바람직한 하한 값 및 임의의 바람직한 상한 값이 함께 조합될 수 있다. Any desirable lower value and any desirable upper limit value may be combined together. 중합에 의해 본 발명의 실리콘 하이드로젤을 얻는 경우에, 중합을 향상시키기 위해 중합 개시제가 또한 첨가될 수 있다. In the case of obtaining the silicone hydrogels of the present invention by polymerization, a polymerization initiator can also be added to enhance polymerization. 적합한 개시제에는 열중합 개시제, 예를 들어, 퍼옥사이드 화합물 또는 아조 화합물, 또는 광중합 개시제(UV, 가시광 또는 조합일 수 있음), 또는 이들의 혼합물이 포함된다. Suitable initiators include thermal polymerization initiators, e.g., peroxide compound or azo compound, or a photopolymerization initiator (UV, which may be a visible light or a combination), or mixtures thereof. 열중합이 사용되는 경우, 원하는 반응 온도에서 최적의 분해 특성을 갖는 열중합 개시제가 선택 및 사용된다. When a thermal polymerization used, a heat polymerization initiator having optimum decomposition characteristics at the desired reaction temperature is selected and used. 일반적으로, 10시간 반감기 온도가 약 40℃ 내지 약 120℃인 아조 유형 개시제 또는 퍼옥사이드 유형 개시제가 바람직하다. In general, the 10-hour half-life temperature of about 40 to about 120 ℃ ℃ the azo type initiator or a peroxide type initiator is preferable. 광중합 개시제의 예에는 카르보닐 화합물, 퍼옥사이드 화합물, 아조 화합물, 황 화합물, 할로겐화 화합물, 금속 염 등이 포함된다. Examples of the photopolymerization initiator include carbonyl compounds, peroxide compounds, azo compounds, sulfur compounds, such as halogenated compounds, metal salts. 광개시제의 더욱 구체적인 예에는 방향족 알파-하이드록시 케톤, 알콕시옥시벤조인, 아세토페논, 아실포스핀 옥사이드, 비스아실포스핀 옥사이드, 및 3차 아민 + 다이케톤, 이들의 혼합물 등이 포함된다. More specific examples of photoinitiators include aromatic alpha-hydroxy ketones, and the like, alkoxy, aryloxy benzoin, acetophenones, acylphosphine oxides, bis-acyl phosphine oxides, and a tertiary amine + diketone, mixtures thereof. 광개시제의 예시적인 예는 1-하이드록시사이클로헥실 페닐 케톤, 2-하이드록시-2-메틸-1-페닐-프로판-1-온, 비스(2,6-다이메톡시벤조일)-2,4-4-트라이메틸펜틸 포스핀 옥사이드(DMBAPO), 비스(2,4,6-트라이메틸벤조일)-페닐 포스핀옥사이드(이르가큐어(Irgacure) 819), 2,4,6-트라이메틸벤질다이페닐 포스핀 옥사이드 및 2,4,6-트라이메틸벤조일 다이페닐포스핀 옥사이드, 벤조인 메틸 에테르, 및 캄포르퀴논과 에틸 4-(N,N-다이메틸아미노)벤조에이트의 배합물이다. Illustrative examples of photoinitiators are 1-hydroxycyclohexyl phenyl ketone, 2-hydroxy-2-methyl-1-phenyl-propan-1-one, bis (2,6-methoxybenzoyl) -2,4 4-trimethyl-pentyl phosphine oxide (DMBAPO), bis (2,4,6-trimethylbenzoyl) -phenyl phosphine oxide (Irgacure (Irgacure) 819), 2,4,6-trimethyl-benzyl-diphenyl phosphine oxide and 2,4,6-trimethylbenzoyl diphenyl phosphine oxide, benzoin methyl ether, camphor quinone, and ethyl 4- (N, N- dimethylamino) is a combination of the benzoate. 구매가능한 가시광 개시제 시스템에는 이르가큐어 819, 이르가큐어 1700, 이르가큐어 1800, 이르가큐어 819, 이르가큐어 1850(모두 바스프(BASF)로부터 구매가능함) 및 루시린(Lucirin) TPO 개시제(바스프로부터 입수가능함)가 포함된다. Commercially available visible light initiator systems include Irgacure 819, Irgacure 1700, Irgacure 1800, Irgacure 819, Irgacure 1850 (all available purchased from BASF (BASF)), and Lucy Lin (Lucirin) TPO initiator (BASF It includes retrieving from available). 구매가능한 UV 광개시제에는 다로큐르(Darocur) 1173 및 다로큐르 2959(바스프)가 포함된다. Commercially available UV photoinitiators include Taro Mercure (Darocur) 1173 and Taro Mercure 2959 (BASF). 이들 및 사용될 수 있는 다른 광개시제는, 본 명세서에 참고로 포함되는 문헌[Volume III, Photoinitiators for Free Radical Cationic & Anionic Photopolymerization, 2 nd Edition by JV Crivello & K. Dietliker; These and other photoinitiators which may be used, the literature is incorporated herein by reference [Volume III, Photoinitiators for Free Radical Cationic & Anionic Photopolymerization, 2 nd Edition by JV Crivello & K. Dietliker; edited by G. Bradley; edited by G. Bradley; John Wiley and Sons; John Wiley and Sons; New York; New York; 1998]에 개시되어 있다. 1998] is disclosed in. 이들 중합 개시제는 독립적으로 사용될 수 있거나 또는 함께 블렌딩될 수 있으며, 사용되는 양은 단량체 성분 100 중량%에 대해 약 1 중량%이다. The polymerization initiator is about 1% by weight of the blend may be either be used independently or in combination, 100 weight% amount of the monomer components used. 본 발명의 콘택트 렌즈를 형성하기 위해 사용되는 반응 혼합물에 존재할 수 있는 다른 성분에는, 자외선 흡수 화합물, 의약 화합물, 건강기능식품(nutriceutical) 화합물, 항미생물 화합물, 다양한 파장의 광에 노출 시 색을 가역적으로 변화시키거나 광을 반사하는 염료 및 화합물을 포함하는 공중합성 및 비중합성 염료, 이형제, 반응성 틴트(tint), 안료, 이들의 배합물 등이 포함된다. The other ingredients that may be present in the reaction mixture used to form the contact lenses of the present invention, ultraviolet absorbing compounds, pharmaceutical compounds, dietary supplements (nutriceutical) compound, antimicrobial compound, a reversible color upon exposure to light of various wavelengths changes reduce or copolymerizable and nonpolymerizable dyes, release agents including a dye and a compound for reflecting light, a reactive tint (tint), and the like pigments and combinations thereof. 중합에 의해서 본 발명의 실리콘 하이드로젤을 얻는 경우에, 중합 용매가 사용될 수 있다. In the case of obtaining the silicone hydrogels of the present invention by polymerization, a polymerization solvent may be used. 용매는 임의의 유형의 유기 또는 무기 용매일 수 있다. The solvent may be organic or inorganic daily for any type of. 사용될 수 있는 예에는 물, 메탄올, 에탄올, 프로판올, 2-프로판올, 부탄올, tert-부탄올, tert-아밀 알코올, 3,7-다이메틸-3-옥탄올, 테트라하이드로리날로올, 및 기타 알코올 유형 용매; Examples that may be used include water, methanol, ethanol, propanol, 2-propanol, butanol, tert- butanol, tert- amyl alcohol, 3,7-dimethyl-3-octanol, tetrahydro linalool, and other alcohol type menstruum; 벤젠, 톨루엔, 자일렌, 및 기타 유형의 방향족 탄화수소 용매; Benzene, toluene, xylene, and other types of aromatic hydrocarbon solvent; 헥산, 헵탄, 옥탄, 데칸, 석유 에테르, 등유, 리그로인, 파라핀, 및 기타 유형의 지방족 탄화수소 용매; Hexane, heptane, octane, decane, petroleum ether, kerosene, ligroin and paraffin, and other types of aliphatic hydrocarbon solvent; 아세톤, 메틸 에틸 케톤, 메틸 아이소부틸 케톤, 및 기타 케톤 유형 용매; Acetone, methyl ethyl ketone, methyl isobutyl ketone, and other ketone type solvent; 에틸 아세테이트, 부틸 아세테이트, 메틸 벤조에이트, 다이옥틸 프탈레이트, 에틸렌 글리콜 다이아세테이트, 및 기타 에스테르 유형 용매; Ethyl acetate, butyl acetate, methyl benzoate, dioctyl phthalate, ethylene glycol diacetate, and other ester type solvents; 다이에틸 에테르, 테트라하이드로푸란, 다이옥산, 에틸렌 글리콜 다이알킬 에테르, 다이에틸렌 글리콜 다이알킬 에테르, 트라이에틸렌 글리콜 다이알킬 에테르, 테트라에틸렌글리콜 다이알킬 에테르, 폴리에틸렌 글리콜 다이알킬 에테르, 폴리에틸렌 글리콜-폴리프로필렌 글리콜 블록 공중합체, 폴리에틸렌 글리콜-폴리프로필렌 글리콜 랜덤 공중합체, 및 기타 유형의 글리콜 에테르 용매가 포함된다. Diethyl ether, tetrahydrofuran, dioxane, ethylene glycol dialkyl ether, diethylene glycol dialkyl ether, triethylene glycol dialkyl ether, tetraethylene glycol dialkyl ether, polyethylene glycol dialkyl ether, polyethylene glycol-polypropylene glycol block copolymer, polyethylene glycol-polypropylene glycol random copolymer, and other types of glycol ether solvent is contained. 용매는 개별적으로, 또는 조합하여 사용될 수 있다. Solvents may be used individually, or in combination. 그 중에서, 얻어지는 실리콘 하이드로젤로부터 용매를 물로 세척하여 용이하게 제거할 수 있다는 관점에서, 알코올 유형 용매 및 글리콜 에테르 유형 용매가 바람직하다. Among them, from the viewpoint that it can easily be removed by washing with water and the solvent from the resulting silicone hydrogel, it is preferred that alcohol type solvents and glycol ether type solvent. 본 발명의 기구를 제조하는 데 유용한 용매에는 에테르, 에스테르, 알칸, 알킬 할라이드, 실란 및 알코올이 포함된다. Useful solvents for preparing the device of the invention include ethers, esters, alkanes, alkyl halides, silane and alcohol. 본 발명을 위한 희석제로서 유용한 에테르의 예에는 테트라하이드로푸란이 포함된다. Examples of useful ether as diluents for this invention include tetrahydrofuran. 본 발명에 유용한 에스테르의 예에는 에틸 아세테이트가 포함된다. Examples of useful esters in the present invention include ethyl acetate. 본 발명을 위한 희석제로서 유용한 알킬 할라이드의 예에는 메틸렌 클로라이드가 포함된다. Examples of alkyl halides useful as diluents for this invention include methylene chloride. 본 발명을 위한 희석제로서 유용한 실란의 예에는 옥타메틸사이클로테트라실록산이 포함된다. Examples of useful silane as diluents for this invention include octamethylcyclotetrasiloxane. 본 발명을 위한 희석제로서 유용한 알코올의 예에는 헥산올, 헵탄올, 옥탄올, 노난올, 데칸올, tert-부틸 알코올, 3-메틸-3-펜탄올, 아이소프로판올, 및 3,7-다이메틸-3-옥탄올이 포함된다. Examples of useful alcohols as diluents for this invention include hexanol, heptanol, octanol, nonanol, decanol, tert- butyl alcohol, 3-methyl-3-pentanol, isopropanol, and 3,7-dimethyl the 3-octanol are included. 본 발명에 유용한 추가의 희석제는, 본 명세서에 참고로 포함되는 미국 특허 제6,020,445호에 개시되어 있다. Additional diluents useful in the present invention, is disclosed in U.S. Patent No. 6,020,445 which is incorporated herein by reference. 본 발명의 실리콘 하이드로젤은 독립적으로 원하는 형상으로 성형하여 사용할 수 있으나, 또한 다른 재료와 블렌딩한 다음 성형할 수 있다. Silicone hydrogels of the present invention can be used by molding into a desired shape independently, and can also be a blend, and then molded with other materials. 더욱이, 성형품의 표면에 코팅이 적용될 수 있다. Furthermore, the coating can be applied to the surface of the molded article. 본 발명의 실리콘 하이드로젤을 위한 용도에는 안과용 렌즈, 내시경, 카테터, 수액 튜브, 기체 수송 튜브, 스텐트, 시스, 커프, 튜브 커넥터, 엑세스 포트, 배액 주머니, 혈액 회로, 상처 피복 재료, 및 다양한 유형의 약제 담체가 포함되나, 콘택트 렌즈, 안내 렌즈, 인공 각막, 각막 인레이(inlay), 및 각막 온레이(onlay)가 특히 적합하며, 콘택트 렌즈가 가장 적합하다. It uses for silicone hydrogel of the present invention, ophthalmic lenses, endoscope, catheter, infusion tube, a gas transport tube, a stent, a sheath, the cuff, a tube connector, the access port, a drainage bag, blood circuit, wound covering materials, and various types a carrier, including, pharmaceutical, contact lenses, intraocular lenses, artificial cornea, and the corneal inlays (inlay), and corneal onlays (onlay) particularly suitable, the contact lens is most suitable. 본 발명의 실리콘 하이드로젤을 성형하여 안과용 렌즈로 사용하는 경우에, 중합 방법 및 성형 방법은 하기와 같은 표준 방법일 수 있다. When molding a silicone hydrogel of the invention for use as ophthalmic lenses, the polymerization method and molding method may be a standard method as described below. 예에는 실리콘 하이드로젤을 먼저 환봉 또는 판으로 성형한 다음 컷팅 또는 래싱(lathing) 공정 등에 의해 원하는 형상으로 기계가공하는 방법, 주형 중합 방법, 스핀 캐스트 방법 등이 포함된다. Examples include a method of machining in a desired shape by a silicone hydrogel first molded into a round bar or a plate and then cut or lashing (lathing) process or the like, the mold polymerization method, a spin casting method or the like. 일례로서, 주형 중합 방법을 사용하여 본 발명의 실리콘 하이드로젤로부터 안과용 렌즈를 제조하는 경우를 하기에 설명한다. By way of example, it will now be described for the case of preparing ophthalmic lenses from silicone hydrogels of the present invention using the mold polymerization method. 단량체 조성물을 렌즈 형상을 갖는 2개의 주형 사이의 공간 내로 주입한다. Inject a monomer composition into the space between two molds having the lens shape. 다음으로, 광중합 또는 열중합을 수행하여 렌즈 형상을 형성한다. Next, perform a photopolymerization or thermal polymerization to form a lens shape. 주형은 플라스틱, 유리, 세라믹, 금속 등으로 제조되나, 광중합의 경우에는, 광중합 파장에 대해 투명한 재료가 사용되며, 보통 플라스틱 또는 유리가 사용된다. Mold, but made of plastic, glass, ceramic, metal or the like, in the case of photopolymerization, the transparent material is used for the curing light wavelength, usually a plastic or glass is used. 실리콘 하이드로젤을 제조하는 경우에는, 2개의 대향하는 주형에 의해 공간을 형성하고, 그 공간 내로 단량체 조성물을 주입한다. When producing the silicone hydrogel, the space formed by the two opposing molds and inject the monomer composition into the space. 다음으로, 공간이 단량체 조성물로 충전된 주형에 자외광, 가시광, 또는 그 조합과 같은 활성화 광을 조사하거나, 또는 오븐 또는 조에 넣고 가열하여 단량체를 중합시킨다. Next, the space character to the charged mold with the monomer composition infrared light, visible light, or irradiated with active light such as a combination thereof, or an oven or heating bath into the monomer is polymerized. 광중합 후에 열중합하거나 또는 반대로 열중합 후에 광중합을 사용함으로써 두 가지 방법을 모두 사용하는 것이 또한 가능하다. After the photo-polymerization by using a thermal polymerization or thermal polymerization, after the photopolymerization contrary I am also possible to use both methods. 광중합의 경우에는, 일반적으로, 예를 들어 수은등 또는 형광등과 같은 광원으로부터의 높은 수준의 광을 포함하는 광을 단기간(보통 1 시간 이하) 동안 조사한다. For the photo-polymerization is, in general, for example, it is irradiated for light containing a high level of light from a light source such as a mercury lamp or fluorescent lamp a short period of time (usually less than an hour). 열중합을 수행하는 경우에는, 중합체의 광학 균일성(optical consistency) 및 품질을 유지하고 재현성(reproducibility)을 증가시키기 위해서, 온도를 수시간 내지 수십 시간에 걸쳐 실온 부근으로부터 약 60℃ 내지 약 200℃의 높은 온도까지 점진적으로 증가시키는 조건이 바람직하다. When performing thermal polymerization, optical uniformity (optical consistency), and maintaining the quality and the reproducibility (reproducibility) in order to increase, to about 60 ℃ from the vicinity of room temperature over the temperature in several hours to several tens of hours of about 200 ℃ of polymer up to the high temperature conditions that gradually increases it is preferred. 본 발명의 실리콘 하이드로젤은 다양한 방법에 의해 개질될 수 있다. Silicone hydrogels of the present invention may be modified by a variety of methods. 용도가 안과용 렌즈이고, 내부에 친수성 중합체가 포함되지 않는 경우에, 렌즈의 습윤 특성을 개선하기 위해서 개질 처리를 수행할 수 있다. And use a lens for the eye, if it does not contain a hydrophilic polymer to the inside, it is possible to perform a reforming process in order to improve the wetting properties of the lens. 구체적인 개질 방법에는 전자기(광 포함) 조사, 플라즈마 조사, 증착, 스퍼터링과 같은 화학 증착 처리, 가열, 주형 이동 코팅(mold transfer coating), 전하 연합 코팅(charge association coating), 염기 처리, 산 처리, 및 기타 적합한 표면 처리제를 사용한 처리가 포함되며, 이들의 조합이 또한 사용될 수 있다. Specific modification methods include electromagnetic (light included) irradiation, plasma irradiation, vapor deposition, chemical vapor deposition processes such as sputtering, heat, mold moving coating (mold transfer coating), electric charge Union coating (charge association coating), base treatment, acid treatment, and Others will include a treatment with a suitable surface treatment agent, the combination thereof may also be used. 염기 처리 또는 산 처리의 예에는 성형품을 염기성 또는 산성 용액과 접촉시키는 방법, 또는 성형품을 염기성 또는 산성 기체와 접촉시키는 방법이 포함된다. For the base treatment, or acid treatment include a method of contacting a method, or a molded product of contacting the shaped article with a basic or acidic solution and the basic or acidic gas. 더욱 구체적인 방법에는, 예를 들어, 염기성 또는 산성 용액에 성형품을 침지하는 방법, 염기성 또는 산성 용액 또는 염기성 또는 산성 기체를 성형품 상에 분무하는 방법, 패들 또는 브러시 등을 사용하여 염기성 또는 산성 용액을 성형품 상에 도포하는 방법, 염기성 또는 산성 용액을 성형품 상에 스핀 코팅하는 방법, 딥 코트 방법 등이 포함된다. More specific methods include, for example, a basic or acidic solution, method of immersing the molded product, the basic or acidic solution or basic or a method of spraying the acidic gas in the molded product, a paddle or a brush or the like by using the molded product of a basic or acid solution the method for applying the phase, a method for spin coating a basic or acidic solution into the molded article, and the like dip coating method. 큰 개질 효과를 제공하는 가장 간단한 방법은 성형품을 염기성 또는 산성 용액에 침지하는 방법이다. The simplest way to provide a great improving effect is a method of immersing the molded product in the basic or acidic solution. 실리콘 하이드로젤을 염기성 또는 산성 용액에 침지할 때의 온도는 특별히 제한되지 않으나, 보통 온도는 대략 약 -50℃ 내지 약 300℃ 범위 이내이다. Temperature at the time of immersion of the silicone hydrogel to the basic or acidic solution is not specifically limited, and usually the temperature is within the range approximately from about -50 ℃ to about 300 ℃. 작업 용이성을 고려할 때, 약 -10℃ 내지 약 150℃의 온도 범위가 더욱 바람직하며, 약 -5℃ 내지 약 60℃의 범위가 가장 바람직하다. Considering the ease of operation, a more preferred temperature range from about -10 ℃ to about 150 ℃, and from about -5 ℃ to range from about 60 ℃ is most preferred. 실리콘 하이드로젤을 염기성 또는 산성 용액에 침지하는 최적 시간은 온도에 따라 좌우되나, 일반적으로 100시간 이하가 바람직하고, 24시간 이하가 더욱 바람직하며, 12시간 이하가 가장 바람직하다. Optimal time for dipping the silicone hydrogel with a basic or acidic solution, but depends on the temperature, generally greater than 100 hours are preferred, and more preferably 24 hours or shorter, and hence most preferably 12 hours or less. 접촉 시간이 너무 긴 경우에는, 작업 용이성 및 생산성이 나빠질 뿐만 아니라, 산소 투과성 감소 및 기계적 특성 저하와 같은 악영향이 있을 수 있다. If the contact time is too long, as well as cause poor operation ease and productivity, it can have adverse effects such as a reduction in oxygen permeability and mechanical properties deteriorate. 사용될 수 있는 염기의 예에는 알칼리 금속 하이드록사이드, 알칼리토 금속 하이드록사이드, 다양한 유형의 카르보네이트, 다양한 유형의 보레이트, 다양한 유형의 포스페이트, 암모니아, 다양한 암모늄 염, 다양한 아민, 및 중합체 염기, 예를 들어, 폴리에틸렌이민 및 폴리비닐 아민 등이 포함된다. Examples of a base that may be used include alkali metal hydroxides, alkaline earth metal hydroxide, various types of carbonate, different types of borates, various types of phosphates, ammonia, various ammonium salts, various amines, and the polymer base, for instance, and the like of polyethyleneimine and polyvinylamine. 그 중에서, 낮은 가격 및 강력한 처리 효과 때문에, 알칼리 금속 하이드록사이드가 가장 바람직하다. Because of those, low price and strong treatment effects, alkali metal hydroxide is most preferred. 사용될 수 있는 산의 예에는 다양한 유형의 무기 산, 예를 들어, 황산, 인산, 염산 및 질산; Examples of acids which can be used include various types of inorganic acids, such as, sulfuric acid, phosphoric acid, hydrochloric acid and nitric acid; 다양한 유형의 유기산, 예를 들어, 아세트산, 포름산, 벤조산, 및 페놀; Various types of organic acids, such as acetic acid, formic acid, benzoic acid, and phenol; 및 다양한 유형의 중합체 산, 예를 들어, 폴리아크릴산 및 폴리스티렌 설폰산 등이 포함된다. And various types of polymeric acid, for example, and the like polyacrylic acid, and polystyrene sulfonic acid. 그 중에서, 처리 효과가 강력하고 다른 물리적 특성에 대한 악영향이 최소한이기 때문에, 중합체 산이 가장 바람직하다. Among them, because the treatment effect is a powerful and minimum adverse effect on other physical properties, and most preferably the polymer acid. 염기성 또는 산성 용액을 위한 용매는 임의의 유형의 무기 또는 유기 용매일 수 있다. Solvents for the basic or acidic solution may be daily for inorganic or organic of any type. 예에는 물, 메탄올, 에탄올, 프로판올, 2-프로판올, 부탄올, 에틸렌 글리콜, 다이에틸렌 글리콜, 트라이에틸렌 글리콜, 테트라에틸렌글리콜, 폴리에틸렌 글리콜, 글리세린, 및 기타 알코올, 벤젠, 톨루엔, 자일렌, 및 기타 방향족 탄화수소, 헥산, 헵탄, 옥탄, 데칸, 석유 에테르, 등유, 리그로인, 파라핀, 및 기타 지방족 탄화수소, 아세톤, 메틸 에틸 케톤, 메틸 아이소부틸 케톤, 및 기타 케톤, 에틸 아세테이트, 부틸 아세테이트, 메틸 벤조에이트, 다이옥틸 프탈레이트, 및 기타 에스테르, 다이에틸 에테르, 테트라하이드로푸란, 다이옥산, 에틸렌 글리콜 다이알킬 에테르, 다이에틸 글리콜 다이알킬 에테르, 트라이에틸렌 글리콜 다이알킬 에테르, 테트라에틸렌글리콜 다이알킬 에테르, 폴리에틸렌 글리콜 다이알킬 에테르 및 기타 에테르, 다이메틸포름아미 Examples include water, methanol, ethanol, propanol, 2-propanol, butanol, ethylene glycol, diethylene glycol, triethylene glycol, tetraethylene glycol, polyethylene glycol, glycerol, and other alcohols, benzene, toluene, xylene, and other aromatic hydrocarbons, hexane, heptane, octane, decane, petroleum ether, kerosene, ligroin and paraffin, and other aliphatic hydrocarbons, acetone, methyl ethyl ketone, methyl isobutyl ketone, and other ketones, ethyl acetate, butyl acetate, methyl benzoate, dioctyl butyl phthalate, and other esters, dimethyl ether, tetrahydrofuran, dioxane, ethylene glycol dialkyl ether, diethyl glycol dialkyl ethers, triethylene glycol dialkyl ether, tetraethylene glycol dialkyl ether, polyethylene glycol dialkyl ethers, and other ether, dimethyl formamido , 다이메틸 아세토아미드, N-메틸-2-피롤리돈, 다이메틸 이미다졸리디논, 헥사메틸 포스폴릭 트라이아미드, 다이메틸 설폭사이드 및 기타 비-양성자성 극성 용매, 메틸렌 클로라이드, 클로로포름, 다이클로로에탄, 트라이클로로에탄, 트라이클로로에틸렌, 기타 할로겐 유형 용매, 및 프레온 유형 용매가 포함된다. , Dimethyl acetoamide, N- methyl-2-pyrrolidone, dimethyl imidazolidinone, hexamethylphosphoric polrik tri-amides, dimethylsulfoxide and other non-protic polar solvent, methylene chloride, chloroform, dichloro ethane, include trichloro ethane, trichloro ethylene, and other halogen-type solvent, and Freon type solvents. 그 중에서, 경제성, 취급의 간편성, 및 화학적 안정성 등의 관점에서, 물이 가장 바람직하다. Among those, from the viewpoints of economy, ease of handling, and chemical stability, and most preferably water. 용매는 또한 둘 이상의 유형의 블렌드일 수 있다. The solvent may also be a blend of two or more types. 본 발명에서, 사용되는 염기성 또는 산성 용액은 염기성 또는 산성 물질과 용매 이외의 성분을 함유할 수 있다. In the present invention, the basic or acidic solution used may also contain components other than the basic or acidic substances and the solvents. 염기성 또는 산성 물질은 염기성 또는 산성 처리 후에 세척에 의해 실리콘 하이드로젤로부터 제거될 수 있다. Basic or acidic substance can be removed from the silicone hydrogel by washing after a basic or acidic treatment. 세척 용매는 임의의 유형의 무기 또는 유기 용매일 수 있다. Cleaning solvent can be every day for an inorganic or organic of any type. 예에는 물, 메탄올, 에탄올, 프로판올, 2-프로판올, 부탄올, 에틸렌 글리콜, 다이에틸렌 글리콜, 트라이에틸렌 글리콜, 테트라에틸렌글리콜, 폴리에틸렌 글리콜, 글리세린, 및 기타 알코올, 벤젠, 톨루엔, 자일렌, 및 기타 방향족 탄화수소, 헥산, 헵탄, 옥탄, 데칸, 석유 에테르, 등유, 리그로인, 파라핀, 및 기타 지방족 탄화수소, 아세톤, 메틸 에틸 케톤, 메틸 아이소부틸 케톤, 및 기타 케톤, 에틸 아세테이트, 부틸 아세테이트, 메틸 벤조에이트, 다이옥틸 프탈레이트, 및 기타 에스테르, 다이에틸 에테르, 테트라하이드로푸란, 다이옥산, 에틸렌 글리콜 다이알킬 에테르, 다이에틸렌 글리콜 다이알킬 에테르, 트라이에틸렌 글리콜 다이알킬 에테르, 테트라에틸렌 글리콜 다이알킬 에테르, 폴리에틸렌 글리콜 다이알킬 에테르 및 기타 에테르, 다이메틸포름아 Examples include water, methanol, ethanol, propanol, 2-propanol, butanol, ethylene glycol, diethylene glycol, triethylene glycol, tetraethylene glycol, polyethylene glycol, glycerol, and other alcohols, benzene, toluene, xylene, and other aromatic hydrocarbons, hexane, heptane, octane, decane, petroleum ether, kerosene, ligroin and paraffin, and other aliphatic hydrocarbons, acetone, methyl ethyl ketone, methyl isobutyl ketone, and other ketones, ethyl acetate, butyl acetate, methyl benzoate, dioctyl butyl phthalate, and other esters, dimethyl ether, tetrahydrofuran, dioxane, ethylene glycol dialkyl ether, diethylene glycol dialkyl ether, triethylene glycol dialkyl ether, tetraethylene glycol dialkyl ether, polyethylene glycol dialkyl ethers, and other ether, dimethyl-formamidinium 미드, 다이메틸 아세토아미드, N-메틸-2-피롤리돈, 다이메틸 이미다졸리디논, 헥사메틸 포스폴릭 트라이아미드, 다이메틸 설폭사이드 및 기타 비-양성자성 극성 용매, 메틸렌 클로라이드, 클로로포름, 다이클로로에탄, 트라이클로로에탄, 트라이클로로에틸렌, 기타 할로겐 유형 용매, 및 프레온 유형 용매가 포함된다. Mead, dimethyl acetoamide, N- methyl-2-pyrrolidone, dimethyl imidazolidinone, hexamethylphosphoric polrik tri-amides, dimethylsulfoxide and other non-protic polar solvent, methylene chloride, chloroform, dimethyl chloroethane, include trichloro ethane, trichloro ethylene, and other halogen-type solvent, and Freon type solvents. 세척 용매는 둘 이상의 유형의 블렌드일 수 있다. Washing solvent may be of two or more types of blend. 세척 용매는 용매 이외의 성분, 예를 들어, 무기염, 계면활성제, 및 세정제를 함유할 수 있다. Washing solvent may contain components other than the solvents, for example, inorganic salts, surface active agents, and cleaning agents. 상기한 바와 같은 개질 처리는 전체 실리콘 하이드로젤에서 수행될 수 있거나, 또는 실리콘 하이드로젤의 일부분에서만, 예를 들어, 표면에서만 수행될 수 있다. Modifying treatment as described above may be performed in the entire silicone hydrogel, or for only such a portion of the silicone hydrogel, it is only on the surface can be carried out. 개질이 표면에서만 수행되는 경우, 전체 실리콘 하이드로젤의 물리적 특성을 극적으로 변화시키지 않으면서 표면 습윤성만을 향상시킬 수 있다. If the modification performed only at the surface, it is only the surface wettability can improve the physical characteristics of the entire silicone hydrogel without change dramatically. 본 발명의 실리콘 하이드로젤의 수분 함량이 너무 낮은 경우에는, 실리콘 하이드로젤이 경질일 것이나, 수분 함량이 너무 높은 경우에는, 수분이 실리콘 하이드로젤의 표면으로부터 증발할 수 있어서 착용자가 렌즈 착용 동안 건조한 렌즈 느낌을 경험할 수 있으므로, 수분 함량은 약 20 내지 약 50 중량%가 바람직하고, 약 25 내지 약 45 중량%가 더욱 바람직하고, 약 30 내지 약 40 중량%가 가장 바람직하다. When the water content of the silicone hydrogels of the present invention is too low, silicon dihydro would be gel is rigid, when the water content is too high, the lens dried while in the water can evaporate from the surface of the silicone hydrogel wearer lenses can experience a sense, the water content is preferably about 20 to about 50% by weight, and from about 25 to about 45 wt%, more preferably, from about 30 to about 40% by weight is most preferred. 하한 값은 약 20 중량%, 약 25 중량%, 및 약 30 중량%이다. The lower limit value is about 20% by weight, about 25%, and about 30% by weight. 상한 값은 약 50 중량%, 약 45 중량%, 및 약 40 중량%이다. The upper limit value is about 50% by weight, about 45% by weight, and about 40% by weight. 임의의 바람직한 하한 값 및 임의의 바람직한 상한 값이 함께 조합될 수 있다. Any desirable lower value and any desirable upper limit value may be combined together. 용도가 안과용 렌즈, 특히 소프트 콘택트 렌즈인 경우에 착용 시 편안한 느낌을 얻기 위해서, 본 발명의 실리콘 하이드로젤의 탄성 모듈러스는 바람직하게는 약 1379.0 ㎪(200 psi) 이하, 일부 실시 형태에서 약 689.58 ㎪(100 psi) 이하이다. To use to obtain a comfortable feel when worn in the case of lenses, particularly soft contact lenses, ophthalmic, the elastic modulus of the silicone hydrogel of the present invention is preferably not greater than about 1379.0 ㎪ (200 psi), from about 689.58 ㎪ In some embodiments a (100 psi) or less. 본 발명의 중합체의 탄성 모듈러스 및 연신율은, 가장 좁은 부분의 폭이 5 ㎜인 어레이 형상 샘플을 절단한 다음 인장 시험기를 사용하여 100 ㎜/min의 속도로 파단될 때까지 신장시켜 측정한다. Modulus of elasticity and elongation of the polymers of the present invention is to cut the shape of the array sample is 5 ㎜ width of the narrowest portion, and then measured by elongation until rupture at a rate of 100 ㎜ / min using a tensile tester. 샘플의 초기 게이지 길이(Lo) 및 파단시 샘플 길이(Lf)를 측정한다. The initial gauge length of the sample (Lo) and sample length at break is measured (Lf). 각각의 조성에 대해 12개의 시편을 측정하고, 평균을 기록한다. Measuring the 12 samples for each composition, and averaged. 인장 모듈러스는 응력/변형 곡선의 초기 선형 부분에서 측정한다. Tensile modulus is measured at the initial linear portion of the stress / strain curve. 연신율(%)은 [(Lf - Lo)/Lo] × 100이다. Elongation (%) is - [(Lf Lo) / Lo] × 100. 본 발명의 실리콘 하이드로젤의 연신율은 바람직하게는 약 100% 이상, 일부 실시 형태에서 약 150% 이상, 및 대부분 일부 실시 형태에서 약 200% 이상이다. Elongation of the silicone hydrogels of the present invention preferably amount to about 100%, about 150%, in some embodiments, at least about 200% and most in some embodiments. 값이 클수록 실리콘 하이드로젤이 쉽게 파단되지 않을 것임을 의미한다. It means that the value is a silicone hydrogel is not easily broken larger. 용도가 안과용 렌즈인 경우에, 본 발명의 실리콘 하이드로젤의 전진 접촉각은 약 70도 이하, 약 60도 이하, 일부 실시 형태에서 약 50도 이하가 바람직하다. If the purpose of ophthalmic lenses, advancing contact angles of silicone hydrogel of the invention is about 70 degrees, about 60 degrees or less, and some embodiments of about 50 degrees or less. 본 발명의 실리콘 하이드로젤의 산소 투과성과 관련하여, 산소 투과 상수는 바람직하게는 약 50×10 -11 (㎠/sec)mLO 2 /(mL·hPa) 이상, 일부 실시 형태에서 50×10 -11 (㎠/sec)mLO 2 /(mL·hPa) 이상이다. With respect to the oxygen permeability of silicone hydrogels of the present invention, the oxygen permeability constant is preferably about 50 × 10 -11 (㎠ / sec ) mLO 2 / (mL · hPa) or higher, 50 × 10 -11 In some embodiments (㎠ / sec) mLO 2 / a or more (mL · hPa). 본 발명의 중합체의 산소 투과 상수는 폴라로그래피 방법에 의해 측정된 값이다. Oxygen permeability constant of the polymers of the present invention is a value measured by a method polrarogeuraepi. 본 발명의 실리콘 하이드로젤의 투명성과 관련하여, 용도가 안과용 렌즈인 경우에, 가시 범위에서의 전광투과율(whole light transmissivity)은 바람직하게는 약 85% 이상, 더욱 바람직하게는 약 90% 이상, 가장 바람직하게는 약 95% 이상이다. In relation to the transparency of the silicone hydrogels of the present invention, when the use of ophthalmic lenses, total light transmittance in the visible range (whole light transmissivity) is preferably at least about 85%, more preferably at least about 90%, and most preferably at least about 95%. 본 발명의 실리콘 하이드로젤은 안과용 렌즈, 내시경, 카테터, 수액 튜브, 기체 수송 튜브, 스텐트, 시스, 커프, 튜브 커넥터, 엑세스 포트, 배액 주머니, 혈액 회로, 상처 피복 재료, 및 다양한 유형의 약제 담체와 같은 의료 용구에 사용하기에 적합하나, 콘택트 렌즈, 안과용 렌즈, 및 인공 각막을 위해 특히 적합하다. Silicone hydrogels of the present invention are ophthalmic lenses, endoscope, catheter, infusion tube, a gas transport tube, a stent, a sheath, the cuff, a tube connector, the access port, a drainage bag, blood circuit, wound covering materials, and various types of drug carriers for and one suitable for use in medical devices such, it is particularly suitable for contact lenses, ophthalmic lenses and artificial corneas. 하기에서 실시예를 사용하여 본 발명을 더욱 상세하게 설명할 것이나, 본 발명은 이러한 실시예에 제한되지 않는다. Would be to Examples more specifically describe the present invention by using in the invention is not limited to this embodiment. 전광투과율은 SM 칼라 컴퓨터(모델 SM-7-CH, 수가 테스트 인스트루먼츠 컴퍼니 리미티드(Suga Test Instruments Co. Ltd.)에 의해 제조됨)를 사용하여 측정하였다. Total light transmittance was measured using a (prepared by the model SM-7-CH, the number of test Instruments Company Limited (Suga Test Instruments Co. Ltd.)) SM color computer. 렌즈 샘플 상의 수분을 가볍게 닦아내고, 이어서 샘플을 광 경로에 세팅하고 측정하였다. Lightly wipe the water on the lens sample, and subsequently setting the sample in an optical path and measurement. ABC 디지매틱 인디케이터(Digimatic Indicator)(ID-C112, 미츠토요 코포레이션(Mitsutoyo Corporation)에 의해 제조됨)를 사용하여 두께를 측정하였고, 두께가 0.14 내지 0.15 ㎜인 샘플을 측정하였다. It was using (produced by ID-C112, honey Toyo Corp. (Mitsutoyo Corporation)) ABC Digimatic Indicator (Digimatic Indicator) measuring the thickness was measured, a sample having a thickness of 0.14 to 0.15 ㎜. 가장 좁은 부분의 폭이 5 ㎜인 어레이 형상 샘플을 렌즈 샘플로부터 절단하고, ABC 디지매틱 인디케이터(ID-C112, 미츠토요 코포레이션에 의해 제조됨)를 사용해 두께를 측정하였고, 이어서, 텐실론(Tensilon)(토요 볼드윈 컴퍼니 리미티드(Toyo Baldwin Co. Ltd.)에 의해 제조된 RTM-100, 크로스 헤드 속도 100 ㎜/min)을 사용하여 탄성 모듈러스 및 연신율을 측정하였다. Was used (as prepared by the ID-C112, honey Toyo Corporation) most of the narrow section width and cut the array-like sample 5 ㎜ from the lens sample, ABC Digimatic Indicator measuring the thickness, then, Tensilon (Tensilon) using (Toyo Baldwin Company Limited (Toyo Baldwin Co. Ltd.) the RTM-100, crosshead speed of 100 ㎜ / min prepared by a) to determine the elastic modulus and elongation. 실리콘 하이드로젤의 수분 함유 상태의 중량(W1) 및 건조 상태의 중량(W2)을 측정하고 하기 식으로 수분 함량을 계산하였다. The water content was calculated by measuring the weight (W2) of the weight of the water-containing state of the silicone hydrogel (W1) and dry formula. 단, 본 발명에서, 실리콘 하이드로젤의 수분 함유 상태는 실리콘 하이드로젤을 6 시간 이상 동안 25℃에서 염수 용액에 침지한 상태를 지칭한다. However, in the present invention, the water-containing state of the silicone hydrogel refers to a state in which the immersion in the salt solution of the silicone hydrogel at 25 ℃ for at least 6 hours. 더욱이, 실리콘 하이드로젤의 건조 상태는 진공 건조기에서 40℃에서 16시간 이상 동안 건조를 수행한 상태를 지칭한다. Further, the dry state of the silicone hydrogel refers to a state of performing the dry for at least 16 hours at 40 ℃ in a vacuum dryer. 폭이 5 ㎜인 짧은 스트립 샘플을 렌즈 샘플로부터 절단하고, 레스카 코포레이션(Rhesca Corporation)에 의해 제조된 WET-6000 동적 접촉각 측정기를 사용하여 동적 접촉각을 측정하였다(침지 속도 7 ㎜/min). Cutting the strip of the short sample width is 5 ㎜ sample from the lens, and less Car Corporation by using a dynamic contact angle measuring instrument WET-6000 manufactured by (Rhesca Corporation) to measure the dynamic contact angle (dipping speed 7 ㎜ / min). 5 ㎜ 폭 1.5 ㎝ 길이 스트립 샘플을 렌즈의 중심 부근으로부터 절단하고, 썬 사이언티픽 컴퍼니 리미티드(Sun Scientific Co. Ltd.)에 의해 제조된 CR-500DX 유량계를 사용하여 측정하였다. Cutting the strip length 5 ㎜ width 1.5 ㎝ sample from near the center of the lens, which was measured using a CR-500DX flow meter manufactured by Sun Scientific Co. Ltd. (Sun Scientific Co. Ltd.). 5 ㎜의 척 폭(chuck width)으로 샘플을 탑재하고, 100 ㎜/min의 속도로 5 ㎜ 신장시킨 후에, 이 샘플을 동일한 속도로 원래의 길이(5 ㎜)로 되돌렸으며, 이러한 사이클을 3회 반복하였다. Of 5 ㎜ with the sample into the chuck width (chuck width), and after 5 ㎜ height at a rate of 100 ㎜ / min, ryeoteumyeo return the sample to its original length (5 ㎜) of the same speed, three times these cycles It was repeated. 2회째에 샘플을 원래의 길이로 되돌리는 도중에 응력이 0(제로)으로 되는 시점으로부터, 3회째의 신장 사이클을 시작한 후에 응력이 가해지기 시작하는 (응력이 더 이상 0이 아닌) 시점까지의 시간의 길이를 응력 제로 시간으로 결정하였다. The way the samples in the second time to return to its original length from a point of time the stress to zero, to after the start of the elongation cycle of the third time the stress is beginning (the stress is no longer 0) being applied to the point of time the length of the stress was determined as the time zero. 응력 제로 시간이 짧을수록 실리콘 하이드로젤의 형상 회복 특성이 양호함을 나타내며, 2초 이하의 값이 바람직하고, 1.5초 이하가 더욱 바람직하고, 1.2초 이하가 가장 바람직하다. The shorter the stress zero time indicates that a satisfactory shape recovery properties of the silicone hydrogel, it is a value of less than 2 seconds are preferred, more preferably less than 1.5 seconds, and most preferably not more than 1.2 seconds. 으로 표시되는 비-실리콘 아크릴아미드 단량체(0.017 g, 1 중량%), 폴리비닐 피롤리돈(PVP K90, 0.132 g, 8 중량%), N,N'-메틸렌 비스아크릴아미드(MBA, 0.018 g, 1.1 중량%), 자외광 흡수제 2-(2'-하이드록시-5'-메타크릴로일옥시 에틸 페닐)-2H-벤조트라이아졸(0.036 g, 2.22 중량%), 3-메틸-3-펜탄올(3M3P, 1.350 g), 및 광개시제 이르가큐어 819(0.004 g, 0.25 중량%)를 함께 블렌딩하고 혼합하였다. Silicone acrylic monomer (0.017 g, 1% by weight), polyvinyl pyrrolidone (PVP K90, 0.132 g, 8% by weight), N, N'- methylenebisacrylamide (MBA, 0.018 g, - a non-represented by 1.1% by weight), ultraviolet light absorber 2- (2'-hydroxy-5'-methacryloyloxy-yloxy-ethyl phenyl) -2H- benzotriazole (0.036 g, 2.22% by weight), 3-methyl-3-pentanol ol (3M3P, 1.350 g), and said photo-initiator were blended and mixed with the curing 819 (0.004 g, 0.25% by weight). 얻어진 단량체 블렌드를 아르곤 분위기에서 탈기시켰다. The resulting monomer blend was degassed under argon atmosphere. 질소 기체 분위기 하의 글로브 박스 내에서, 렌즈 형상을 갖는 투명한 플라스틱(프론트 커브 측: 제오노르(Zeonor), 베이스 커브 측: 폴리프로필렌) 주형의 공동 내에 단량체 블렌드를 주입하고, 광(필립스(Philips) TL03, 1.6 mW/㎠, 15분)을 조사해 경화시켜 렌즈를 얻었다. In under the glove box a nitrogen gas atmosphere, a clear plastic having a lens shape (front curve side: fifth Nord (Zeonor), the base curve side: polypropylene) injecting the monomer blend in the cavity of the mold, and the light (Philips (Philips) TL03 , 1.6 mW / ㎠, to check cure of 15 minutes) to give a lens. 2-프로판올(IPA)의 70%(부피 비) 수용액에 실온에서 70분 동안 침지함으로써, 얻어진 렌즈를 주형으로부터 박리하고 잔류 단량체와 같은 불순물을 추출하였다. By 2-propanol (IPA) and soaked for 70 minutes at room temperature in 70% (by volume) aqueous solution, and peeled off, thereby obtaining the lens from the molds and extracted impurities, such as residual monomers. 물에 10분 동안 침지한 후에, 샘플을 5 mL 바이알 병 중의 붕산 완충 용액(pH 7.1 내지 7.3)에 잠기게 넣고, 바이알 병을 오토클레이브에 넣고 120℃에서 30분 동안 끓였다. After immersion for 10 minutes in water, immersing the sample into a boric acid buffer solution (pH 7.1 to 7.3) in 5 mL glass vial, placed into a vial bottle in an autoclave at 120 ℃ boiled for 30 minutes. 얻어진 렌즈 샘플의 전광투과율, 수분 함량, 탄성 모듈러스, 및 연신율은 표 1에 나타낸 바와 같았으며, 따라서 투명하며 양호한 물리적 특성들 사이의 균형을 갖는 렌즈를 얻었다. Total light transmittance of the lens samples obtained, the water content, elastic modulus, and elongation were like shown in Table 1, and thus to obtain a transparent lens having a good balance among the physical properties. 조성을 표 1에 나타낸 바와 같이 변경한 점을 제외하고는, 실시예 1과 유사한 방식으로 중합하여 렌즈 샘플을 얻었다. Except for changing the composition as shown in Table 1, the polymerization in the similar manner as in Example 1 to obtain a lens sample. 얻어진 샘플의 외관, 전광투과율, 수분 함량, 탄성 모듈러스, 및 연신율은 표 1에 나타낸 바와 같았다. Appearance of the sample, total light transmittance, moisture content, elastic modulus, and elongation obtained were as shown in Table 1. 로 표시되는 단량체를 화학식 h1으로 표시되는 단량체 대신에 비-실리콘 아크릴아미드 단량체로서 사용한 점을 제외하고는, 실시예 1과 유사한 방식으로 렌즈 샘플을 제작하였다. To prepare a lens sample in a similar manner as in Example 1, except that used as the silicone acrylate monomer-monomer instead of the monomer ratio being represented by the chemical formula represented by h1. 얻어진 샘플의 외관, 전광투과율, 수분 함량, 탄성 모듈러스, 및 연신율은 표 1에 나타낸 바와 같았다. Appearance of the sample, total light transmittance, moisture content, elastic modulus, and elongation obtained were as shown in Table 1. 조성을 표 1에 나타낸 바와 같이 변경한 점을 제외하고는, 실시예 7과 유사한 방식으로 중합하여 렌즈 샘플을 얻었다. Except for changing the composition as shown in Table 1, the polymerization in the similar manner as in Example 7 to obtain a lens sample. 얻어진 샘플의 외관, 전광투과율, 수분 함량, 탄성 모듈러스, 및 연신율은 표 1에 나타낸 바와 같았다. Appearance of the sample, total light transmittance, moisture content, elastic modulus, and elongation obtained were as shown in Table 1. 으로 표시되는 2-하이드록시에틸 아크릴아미드(HEAA)를 화학식 h1으로 표시되는 단량체 대신에 비-실리콘 아크릴아미드 단량체로서 사용하고, 조성이 표 1에 나타낸 바와 같았다는 점을 제외하고는, 실시예 1과 유사한 방식으로 중합하여 렌즈 샘플을 얻었다. A 2-hydroxyethyl acrylamide (HEAA) represented by the ratio, instead of the monomer represented by the formula h1 - used as the silicone acrylate monomer, and the compositions were as shown in Table 1, except for the point in Example 1, polymerized in a similar manner to obtain the lens samples. 얻어진 샘플의 외관, 전광투과율, 수분 함량, 탄성 모듈러스, 및 연신율은 표 1에 나타낸 바와 같았다. Appearance of the sample, total light transmittance, moisture content, elastic modulus, and elongation obtained were as shown in Table 1. 표 1의 데이터로부터, 전체 렌즈 투과율이 바람직하지 않게 낮았음을 알 수 있다. From the data of Table 1, it can be seen that the transmittance of the overall lens undesirably low. 따라서, 질소 상에 수소를 갖고 오직 하나의 하이드록실기를 갖는 비-실리콘 아크릴아미드 단량체는 제형에 바람직한 수준의 상용성을 제공하지 않는다. Therefore, the ratio that has only a single hydroxyl group, a hydrogen on the nitrogen-silicon acrylamide monomers does not provide the desired level of compatibility with the formulation. 비교예 1 내지 비교예 5는 바람직한 모듈러스를 나타내었다. Comparative Examples 1 to 5 are given the desired modulus. 로 표시되는 단량체를 실리콘 아크릴아미드 단량체로서 사용하고, 화학식 h1 또는 h2로 표시되는 단량체를 비-실리콘 아크릴아미드 단량체로서 사용하여, 표 2에 나타낸 조성으로, 실시예 1과 유사한 방식으로 렌즈 샘플을 제작하였다. Using a monomer represented by a silicone acrylate monomer, and a monomer represented by the formula h1 or h2 the non-production of the lens samples in a similar manner using a silicon acrylate monomer, in the proportion shown in Table 2, as in Example 1, It was. 얻어진 샘플의 전광투과율, 수분 함량, 탄성 모듈러스, 및 연신율은 표 2에 나타낸 바와 같았다. Total light transmittance of the sample, the moisture content, elastic modulus, and elongation obtained were as shown in Table 2. 화학식 s2로 표시되는 단량체를 비-실리콘 아크릴아미드 단량체로서 사용하고 화학식 h0으로 표시되는 HEAA를 실리콘 아크릴아미드 단량체로서 사용하여, 표 2에 나타낸 조성으로, 실시예 1과 유사한 방식으로 렌즈 샘플을 제작하였다. A monomer represented by the formula s2 non-a lens sample in a similar manner and using a silicone acrylic monomer using HEAA represented by the formula h0 as silicone acrylate monomer, in the proportion shown in Table 2, Example 1, was prepared . 얻어진 샘플의 전광투과율, 수분 함량, 탄성 모듈러스, 및 연신율은 표 2에 나타낸 바와 같았다. Total light transmittance of the sample, the moisture content, elastic modulus, and elongation obtained were as shown in Table 2. 비교예 6 내지 비교예 9의 결과를 실시예 12 내지 실시예 16과 비교하면, HEAA가 이들 계를 위한 상용화제로서 충분하지 않음을 알 수 있다. Comparing the results of Comparative Examples 6 to 9 and Comparative Examples Examples 12 to Example 16, it can be seen that HEAA is not sufficient as a compatibilizer for these systems. 이는 메타크릴레이트 변형인 2-하이드록시에틸 메타크릴레이트가 실리콘 하이드로젤에서 상용화 성분으로서 기능하기 때문에 의외이다. This is surprising since the methacrylates modification of 2-hydroxyethyl methacrylate to serve as a compatibilizing component in the silicone hydrogel. 그러나, HEAA를 사용하는 비교예 6 내지 비교예 9의 제형은 바람직한 낮은 모듈러스를 나타낸다. However, the formulation of Comparative Example 6 to Comparative Example 9 using the HEAA shows a preferred low modulus. 표 3에 나타낸 성분을 N,N'-메틸렌 비스아크릴아미드(MBA, 1.1 중량%), 2-(2'-하이드록시-5'-메타크릴로일옥시 에틸 페닐)-2H-벤조트라이아졸(노르블록(Norbloc), 2.2 중량%), 광개시제 이르가큐어 819(0.25 중량%) 및 용매로서의 3차 아밀 알코올(t-AA)과 함께, 45 중량% 희석제 대 55 중량% 성분의 비율로 블렌딩하고, 혼합하였다. The components shown in Table 3 N, N'- methylenebisacrylamide (MBA, 1.1% by weight), 2- (2'-hydroxy-5'-methacryloyloxy-yloxy-ethyl-phenyl) -2H- benzotriazole ( Nord block (Norbloc), 2.2 wt%), a photoinitiator said that with the curing 819 (0.25 wt%) and tertiary amyl alcohol (t-AA) as a solvent, and blended in a proportion of 45% by weight diluent for 55% by weight of component and mixed. 하기 약어를 표 3에 사용하였다. It was to use abbreviations in Table 3. 얻어진 단량체 블렌드를 진공 하에서 탈기시켰다. The resulting monomer blend was degassed under vacuum. 질소 기체 분위기 하의 글로브 박스 내에서, 렌즈 형상을 갖는 투명한 플라스틱(프론트 커브 측: 제오노르, 베이스 커브 측: 폴리프로필렌) 주형의 공동 내에 단량체 블렌드를 주입하고, 광(필립스 TL03, 1.5 mW/㎠, 15분)을 조사해 경화시켜 렌즈를 얻었다. In under the glove box a nitrogen gas atmosphere, a clear plastic having a lens shape (front curve side: fifth Nord, the base curve side: polypropylene) injecting the monomer blend in the cavity of the mold, and the light (Philips TL03, 1.5 mW / ㎠, to check cure of 15 minutes) to give a lens. 실온에서 약 90분 동안 아이소프로필 알코올(IPA) 및 탈이온수의 70 / 30(vol /vol) 혼합물에 침지함으로써, 렌즈를 주형으로부터 박리하고 잔류 단량체와 같은 불순물을 제거하였다. By immersing the 70/30 (vol / vol) mixture of from about 90 minutes Isopropanol (IPA) and DI water at room temperature, the lens was separated from the mold, and removing impurities, such as residual monomers. 추출 후에, 렌즈를 이어서 약 90분 동안 탈이온수에 침지하여 IPA를 제거하고 이어서 표준 패킹 용액 중에 보관하여 평형화시켰다. After extraction, the lenses were immersed in deionized water for about 90 minutes and then to remove the IPA and then equilibrated by storing the standard packing solution. 개별 렌즈를 약 5 ml의 패킹 용액이 담긴 유리 바이알에 넣고 약 120℃에서 30분 동안 오토클레이빙하였다. Insert the individual lenses in a glass vial the packing solution of about 5 ml was filled with clay auto ice for 30 minutes at about 120 ℃. 렌즈 탁도(haze), 수분 함량, 동적 접촉각(DCA) 및 탄성 모듈러스에 대해 측정된 값을 표 3에 열거한다. Lists the measured values ​​for the lens turbidity (haze), water content, dynamic contact angle (DCA) and the elastic modulus are shown in Table 3. 따라서, 충분히 투명하며 양호한 물리적 특성들 사이의 균형을 나타내는 렌즈를 얻었다. Therefore, to obtain a lens that represents the balance between fully transparent and good physical properties. 여기서, F는 습윤력이고, γ는 프로브 액체의 표면장력이고, p는 매니스커스에서 샘플의 둘레이고 θ는 접촉각이다. Here, F is the wetting force, γ is the surface tension of the probe liquid, p is the perimeter of the sample, and θ is the contact angle at the meniscus. 진행 접촉각은 샘플이 패킹 용액 내에 침지되어 있는 습윤 실험의 일부로부터 얻어진다. Progress contact angle is obtained from the portion of the wetting experiment where the sample is immersed in the packaging solution. 각 샘플을 4회 순환시키고 결과를 평균하여 렌즈에 대한 진행 접촉각을 얻었다. 4 cycles each sample and the average the results to obtain a progression angle of contact with the lens. 실시예 17 내지 실시예 19 및 실시예 31 내지 실시예 36에서 탁도는 수화된 시험 렌즈를 주위 온도에서 평탄한 흑색 배경 위의 투명한 20 × 40 × 10 ㎜ 유리 셀 내의 붕산염 완충 염수에 넣고, 광섬유 램프(4 내지 5.4의 출력 세팅으로 설정된 0.5" 직경 광 가이드를 갖는, 티나 툴 서플라이 컴퍼니(Titna Tool Supply Co.) 광섬유 라이트)를 사용하여 렌즈 셀에 수직에서 66° 각도로 아래로부터 조명하고, 렌즈 플랫폼 14 ㎜ 위에 위치한 비디오 카메라(나비타(Navitar) TV 줌 7000 줌 렌즈를 갖는 DVC 1300C:19130 RGB 카메라)를 사용하여 렌즈 셀에 수직으로 위로부터 렌즈의 이미지를 캡쳐하여 측정하였다. EPIX XCAP V 1.0 소프트웨어를 사용하여 블랭크 셀의 이미지를 제거함으로써 렌즈의 산란으로부터 배경 산란(background scatter)을 제거한다. 제거된 산란광 이미지를, 렌즈의 중심 10 ㎜ Examples 17 to Example 19 and Example 31 to Example 36 In turbidity placed in borate buffered saline in a clear 20 × 40 × 10 ㎜ glass cell above a flat black background with a hydrated test lens in the ambient temperature, the optical fiber lamp ( It is set to 4 to 5.4 with an output setting of 0.5 "diameter light guides, Tina tool supply Company (Titna tool supply Co.) optical fiber light) lens platform 14 illuminated from below to 66 ° angle from the normal to the lens cell, and using a video camera positioned above ㎜. (DVC 1300C having a butterfly other (Navitar) TV zoom 7000 zoom lens: 19130 RGB camera) was measured by capturing an image of the lens vertically from the top of the lens cell using the EPIX XCAP V 1.0 software used to remove the background scattering (background scatter) from the scatter of the lens by removing the image of a blank cell. the scattered light image removal, the center of the lens 10 ㎜ 걸쳐 적분하고, 이어서 임의로 탁도 값 100으로 정해진, -1.00 디옵터 CSI 씬 렌즈(Thin Lens)(등록상표)와 비교하여 (탁도 값 0으로 정해진 렌즈는 없음), 정량 분석한다. 5개의 렌즈를 분석하고 결과를 평균하여 표준 CSI 렌즈에 대한 백분율로서 탁도 값을 산출한다. And integrating over, then optionally compared to the turbidity value 100 determined, -1.00 diopter CSI Thin Lens (Thin Lens) (R) (No lens determined by the turbidity value of 0), the quantitative analysis and the analysis of lenses 5 average the results to calculate the turbidity value as a percentage of the standard CSI lens. 실시예 17 내지 실시예 19 및 실시예 31 내지 실시예 36에서 모듈러스는 초기 게이지 높이로 낮추어지는 로드 셀(load cell)을 구비한 정속 이동형 인장 시험기의 크로스헤드를 사용하여 측정하였다. In Example 17 to Example 19 and Example 31 to Example 36. Modulus was measured by using the crosshead of a constant-speed tensile testing machine equipped with a movable load cell (load cell) to be lowered to the initial gauge height. 적합한 시험기에는 인스트론(Instron) 모델 1122가 포함된다. Suitable testing machine includes an Instron (Instron) model 1122. 1.33 ㎝(0.522 인치) 길이, 0.701 ㎝(0.276 인치) "귀부"(ear) 폭 및 0.541 ㎝(0.213 인치) "목부"(neck) 폭을 갖는 아령 형상 샘플을 그립들 안에 끼우고, 파단될 때까지 2 in/min의 일정한 변형 속도로 연신한다. 1.33 ㎝ (0.522 inches) long, 0.701 ㎝ (0.276 inches) "ear" (ear) wide and 0.541 ㎝ (0.213 in. ), "Neck" (neck), fit the dumbbell shaped sample having a width in the grip, when the breaking to be drawn at a constant deformation rate of 2 in / min. 샘플의 초기 게이지 길이(Lo) 및 파단시 샘플 길이(Lf)를 측정한다. The initial gauge length of the sample (Lo) and sample length at break is measured (Lf). 각각의 조성에 대해 12개의 시편을 측정하고, 평균을 기록한다. Measuring the 12 samples for each composition, and averaged. 인장 모듈러스는 응력/변형 곡선의 초기 선형 부분에서 측정한다. Tensile modulus is measured at the initial linear portion of the stress / strain curve. 연신율(%)은 [(Lf - Lo)/Lo] × 100이다. Elongation (%) is - [(Lf Lo) / Lo] × 100. 조성을 표 3에 나타낸 바와 같이 변경한 점을 제외하고는, 실시예 17과 유사한 방식으로 중합하여 렌즈 샘플을 얻었다. Except for changing the composition as shown in Table 3 and is polymerized in a similar manner as in Example 17 to obtain the lens samples. 렌즈 탁도, 수분 함량, 동적 접촉각(DCA) 및 탄성 모듈러스에 대해 측정된 값을 표 3에 열거한다. Lists the measured values ​​for the lens turbidity, and water content, dynamic contact angle (DCA) and the elastic modulus are shown in Table 3. 조성을 표 3에 나타낸 바와 같이 변경한 점을 제외하고는 실시예 17 과 유사한 방식으로 렌즈 샘플을 제작하였다. Composition, except that were changed as shown in Table 3 to prepare a lens sample in a similar manner as in Example 17. 렌즈 탁도, 수분 함량, 동적 접촉각(DCA) 및 탄성 모듈러스에 대해 측정된 값을 표 3에 열거한다. Lists the measured values ​​for the lens turbidity, and water content, dynamic contact angle (DCA) and the elastic modulus are shown in Table 3. 실시예 20 내지 실시예 22를 실시예 17과 비교하면, PVP 함량을 감소시킨 경우에, 얻어지는 렌즈는 투명하나, 덜 습윤성임을 알 수 있다. Example 20 when compared to embodiment example 22 and Example 17, when reducing the PVP content, the resulting lens was a transparent one, it can be seen that a less wettable. 실시예 23 내지 실시예 25를 실시예 17과 비교하면, PVP 함량을 증가시킨 경우 또는 비-실리콘 단량체를 (h2)로 변경한 경우에, 얻어지는 렌즈는 습윤성이나, 덜 투명함을 알 수 있다. Embodiment Comparing Example 23 to Example 25 and Example 17, when a greater PVP content or non-when changing the silicon monomer (h2), the resulting lens may be seen that the wettability or less transparent. 화학식 h2의 비-실리콘 (메트)아크릴아미드 단량체를 사용한 점을 제외하고는 실시예 17과 유사한 방식으로 렌즈 샘플을 제작하였다. Of formula h2 non- except that using silicon (meth) acrylic monomer to prepare a lens sample in a similar manner as in Example 17. 렌즈 탁도, 수분 함량, 동적 접촉각(DCA) 및 탄성 모듈러스에 대해 측정된 값을 표 3에 열거한다. Lists the measured values ​​for the lens turbidity, and water content, dynamic contact angle (DCA) and the elastic modulus are shown in Table 3. 2-(N-메틸아미노)에탄올(7.88 g, 0.105 mol) 및 테트라하이드로푸란(100 mL)을 300 mL 3구 플라스크에 넣고, 얼음조(-10 내지 -5℃) 내에 놓은 채로 약 20분에 걸쳐 아크릴산 클로라이드(4.1 mL, 0.05 mol)를 적하 깔때기를 사용하여 적가하였다. 2- (N- methylamino) ethanol (7.88 g, 0.105 mol) and tetrahydrofuran (100 mL) were placed in a 300 mL 3-neck flask, about 20 minutes while placed in an ice bath (-10 to -5 ℃) It was added dropwise over to the acid chloride (4.1 mL, 0.05 mol) using a dropping funnel. 으로 표시되는 단량체를 얻었다. To obtain a monomer represented by. 로 표시되는 단량체를 얻었다. To obtain a monomer represented by the. 화학식 h3 및 h4로 표시되는 단량체를 화학식 h1로 표시되는 단량체 대신에 비-실리콘 아크릴아미드 단량체로서 사용하고, 조성을 표 4에 나타낸 바와 같이 변경한 점을 제외하고는, 실시예 1과 유사한 방식으로 렌즈 샘플을 제작하였다. Formula h3 and instead of monomers represented the monomers represented by h4 by the formula h1 non-silicone acrylamide is used as monomers, and the lens in the composition of Table 4, similar manner as in Example 1, except for changing a point as illustrated in the samples were manufactured. 얻어진 샘플의 외관, 전광투과율, 수분 함량, 탄성 모듈러스, 및 연신율은 표 4에 나타낸 바와 같았다. Appearance of the sample, total light transmittance, moisture content, elastic modulus, and elongation obtained were as shown in Table 4. 그러므로, 본 발명은 실리콘 하이드로젤에 관한 것이며, 이러한 실리콘 하이드로젤은 의료 기구에 사용하기에 적합하고, 콘택트 렌즈, 안내 렌즈, 인공 각막 등에 사용하기에 특히 적합하다. Thus, the present invention relates to a silicone hydrogel, such silicone hydrogel is suitable for use in a medical device, and is particularly suitable for used in contact lenses, intraocular lenses, artificial cornea. 로 나타내어지는 적어도 하나의 비-실리콘 (메트)아크릴아미드 단량체를 함유하는, 실리콘 하이드로젤. Being represented by at least one non-, silicone hydrogels containing silicone (meth) acrylamide monomers. 제1항에 있어서, 상기 비-실리콘 (메트)아크릴아미드 단량체는 2개 이상의 하이드록실기를 포함하는, 실리콘 하이드로젤. The method of claim 1, wherein the non-silicone (meth) acrylamide monomer, a silicone hydrogel comprising at least two hydroxyl groups. 제1항에 있어서, 상기 비-실리콘 (메트)아크릴아미드 단량체는 하나의 하이드록실기를 포함하며 아미드 수소를 포함하지 않는, 실리콘 하이드로젤. The method of claim 1, wherein the non-silicone (meth) acrylamide monomer including a hydroxyl group and does not contain the amide hydrogen, silicon hydrogel. 제1항 내지 제3항 중 어느 한 항에 있어서, 상기 단량체 믹스는, 상기 단량체 믹스 중 단량체 성분 및 중합체 성분의 총량을 기준으로, 분자량이 1000 이상인 적어도 하나의 친수성 중합체를 1 내지 30 중량%로 추가로 포함하는, 실리콘 하이드로젤. Claim in claims 1 to 3 any one of the preceding, the monomer mix is ​​based on the total amount of the monomer components and the polymer component of the monomer mix, it is at least 1 to 30% by weight of a hydrophilic polymer greater than 1000 molecular weight in the one wherein , silicone hydrogel further comprises a. 제1항에 있어서, 상기 실리콘 단량체는 적어도 하나의 실리콘 (메트)아크릴아미드 단량체를 포함하며, 상기 실리콘 (메트)아크릴아미드 단량체 및 비-실리콘 (메트)아크릴아미드 단량체는 상기 단량체 믹스 중 단량체 성분의 총량에 대해 90 중량% 이상의 양으로 상기 단량체 믹스에 존재하는, 실리콘 하이드로젤. The method of claim 1 wherein the silicon monomer is at least one silicone (meth) an acrylamide monomer, wherein the silicone (meth) acrylamide monomer and a non-silicone (meth) acrylamide monomers of the monomer components of the monomer mix in an amount of at least 90 wt.% based on the total amount present in the monomer mix, of silicon hydrogel. 제1항 내지 제3항 및 제5항 중 어느 한 항에 있어서, 상기 실리콘 단량체는 적어도 하나의 하이드록실기를 갖는, 실리콘 하이드로젤. Claim 1 to claim 3 and claim 5 according to any one of claim wherein the silicon monomers, silicone hydrogel having at least one hydroxyl group. [화학식 a1 및 a2에서, R 1 은 독립적으로 수소 원자 또는 메틸기를 나타내고; [In the formula a1 and a2, R 1 independently represents a hydrogen atom or a methyl group; R 2 는 1 내지 20개의 탄소 원자 및 적어도 하나의 하이드록실기를 갖는 알킬기를 나타내고; R 2 represents an alkyl group having from 1 to 20 carbon atoms and at least one hydroxyl group; R 3 은 독립적으로, 치환 기를 가질 수 있는 1 내지 20개의 탄소 원자를 갖는 알킬렌기 또는 치환 기를 가질 수 있는 6 내지 20개의 탄소 원자를 갖는 아릴렌기를 나타내고; R 3 are, each independently, represents an arylene group having 6 to 20 carbon atoms which may have an alkylene group or substituted with from 1 to 20 carbon atoms which may have a substituted; R 4 는 H, 치환 기를 가질 수 있는 1 내지 20개의 탄소 원자를 갖는 알킬기 또는 치환 기를 가질 수 있는 6 내지 20개의 탄소 원자를 갖는 아릴기를 나타내고; R 4 represents an aryl group having from 6 to 20 carbon atoms which may have an alkyl or substituted having from 1 to 20 carbon atoms that may have a group selected from H, substituted; A는 실록사닐기를 나타냄]. A represents an sanil siloxane. [화학식 b1 또는 b2에서, R 1 은 독립적으로 수소 원자 또는 메틸기를 나타내고; [In the formula b1 or b2, R 1 independently represents a hydrogen atom or a methyl group; R 5 내지 R 9 는 독립적으로, 1 내지 20개의 탄소 원자를 갖는 알킬기 또는 6 내지 20개의 탄소 원자를 갖는 아릴기를 나타내고; R 5 to R 9 are, each independently, an aryl or an alkyl group having 6 to 20 carbon atoms having from 1 to 20 carbon atoms; n은 1 내지 50 범위의 자연수임]. n is from 1 to 50 range of natural numbers. [화학식 b3 또는 b4에서, R 1 은 독립적으로 수소 원자 또는 메틸기를 나타내고; [In the formula b3 or b4, R 1 independently represents a hydrogen atom or a methyl group; R 10 내지 R 13 은 독립적으로, 1 내지 20개의 탄소 원자를 갖는 알킬기 또는 6 내지 20개의 탄소 원자를 갖는 아릴기를 나타내고; R 10 to R 13 are, each independently, an alkyl group or an aryl group having 6 to 20 carbon atoms having from 1 to 20 carbon atoms; m은 0 내지 2 범위의 자연수임]. m is from 0 to 2 in the range of natural numbers. [화학식 c1 내지 c3에서, R 1 은 독립적으로 수소 원자 또는 메틸기를 나타냄]. [In the formula c1 to c3, R 1 is independently a hydrogen atom or a methyl group. 제4항에 있어서, 상기 적어도 하나의 친수성 중합체는 폴리-N-비닐 피롤리돈, 폴리-N-비닐-2-피페리돈, 폴리-N-비닐-2-카프로락탐, 폴리-N-비닐-3-메틸-2-카프로락탐, 폴리-N-비닐-3-메틸-2-피페리돈, 폴리-N-비닐-4-메틸-2-피페리돈, 폴리-N-비닐-4-메틸-2-카프로락탐, 폴리-N-비닐-3-에틸-2-피롤리돈, 폴리-N-비닐-4,5-다이메틸-2-피롤리돈, 폴리비닐 이미다졸, 폴리-N-비닐 포름아미드, 폴리-N-비닐 (메틸)아세트아미드, 폴리-N-메틸-N-비닐 (메틸)아세트아미드, 폴리-N-비닐-N-메틸프로피온아미드, 폴리-N-비닐-N-메틸-2-메틸프로피온아미드, 폴리-N-비닐-2-메틸프로피온아미드, 폴리-N-비닐-N,N'-다이메틸우레아, 폴리-N,N-다이메틸 아크릴아미드, 폴리-N,N-다이에틸 아크릴아미드, 폴리-N-아이소프로필 아크릴아미드, 폴리비닐 알코올, 폴리아크릴레이트, 폴리에틸렌 옥사이드, 폴 The method of claim 4, wherein the at least one hydrophilic polymer is poly -N- vinylpyrrolidone, poly -N- vinyl-2-piperidone, poly-vinyl-2-caprolactam, -N-, -N- poly-vinyl- 3-methyl-2-caprolactam, poly -N- vinyl-3-methyl-2-piperidone, poly-4-vinyl -N- methyl-2-piperidone, poly-vinyl-4-methyl-2 -N- - caprolactam, poly -N- vinyl-3-ethyl-2-pyrrolidone, poly -N- vinyl-4,5-dimethyl-2-pyrrolidone, polyvinyl imidazole, poly-vinyl formamide -N- amides, poly vinyl -N- (methyl) acetamide, poly -N- methyl vinyl -N- (methyl) acetamide, poly vinyl -N- -N- methylpropionamide, poly vinyl -N- -N- methyl- 2-methylpropionamide, poly-vinyl-2 -N- methylpropionamide, poly vinyl -N- -N, N'- dimethyl-urea, poly -N, N- dimethyl-acrylamide, poly -N, N- diethyl acrylamide, poly -N- isopropyl acrylamide, polyvinyl alcohol, polyacrylate, polyethylene oxide, Paul -2-에틸 옥사졸린, 헤파린, 다당류, 폴리-아크릴로일 모르폴린, 및 이들의 혼합물 및 이들의 공중합체로 이루어진 군으로부터 선택되는, 실리콘 하이드로젤. 2-ethyl-oxazoline, heparin, polysaccharides, poly-acryloyl morpholine, and mixtures thereof and, silicone hydrogel is selected from the group consisting of a copolymer thereof. 제4항에 있어서, 상기 적어도 하나의 친수성 중합체는 폴리비닐 피롤리돈, 폴리(N,N-다이메틸 아크릴아미드), 폴리-N-비닐 (메틸)아세트아미드, 폴리아크릴레이트, 폴리비닐 알코올, 및 이들의 공중합체로 이루어진 군으로부터 선택되는, 실리콘 하이드로젤. The method of claim 4, wherein the at least one hydrophilic polymer is polyvinylpyrrolidone, poly (N, N- dimethyl-acrylamide), poly vinyl -N- (methyl) acetamide, polyacrylates, polyvinyl alcohol, and, a silicone hydrogel is selected from the group consisting of a copolymer thereof. 제5항에 있어서, 상기 단량체 믹스 중 단량체 성분의 총량에 대한 상기 (메트)아크릴아미드 단량체의 조성 양은 95 중량% 이상인, 실리콘 하이드로젤. Claim 5 wherein the (meth) acrylic monomer composition of at least the amount of 95% by weight, the silicone hydrogel to the total amount of the monomer components of the monomer mix. 제1항 내지 제3항, 제5항, 제7항 내지 제9항 및 제13항 중 어느 한 항에 있어서, 상기 단량체 믹스는 하이드록실기를 갖지 않는 적어도 하나의 비-실리콘 (메트)아크릴아미드 단량체를 1 내지 50 중량%로 추가로 포함하는, 실리콘 하이드로젤. Claim 1 to claim 3, claim 5, claim 7 to claim 9 and claim 13 according to any one of, wherein said monomer mix comprises at least one ratio does not have a hydroxyl group-silicone (meth) acrylate further comprising a monomer of 1 to 50% by weight, and silicon hydrogel. 제14항에 있어서, 하이드록실기를 갖지 않는 상기 비-실리콘 (메트)아크릴아미드 단량체는 (메트)아크릴아미드, N,N-다이메틸 (메트)아크릴아미드, N,N-다이에틸 (메트)아크릴아미드, N-아이소프로필 (메트)아크릴아미드, (메트)아크릴로일 모르폴린, 및 N-메톡시 메틸 (메트)아크릴아미드로 이루어진 군으로부터 선택되는, 실리콘 하이드로젤. According to claim 14, wherein the non-hydroxy group not having a rock-silicone (meth) acrylamide monomers include (meth) acrylamide, N, N- dimethyl (meth) acrylamide, N, N- diethyl (meth) acrylamide, N- isopropyl (meth) acrylamide, (meth) acryloyl morpholine, and N- methoxymethyl (meth) silicone hydrogel is selected from the group consisting of acrylamide. 제1항 내지 제3항, 제5항, 제7항 내지 제9항 및 제13항 중 어느 한 항에 기재된 실리콘 하이드로젤로부터 제조된, 의료 기구. Claim 1 to claim 3, claim 5, claim 7 to claim 9 and the medical instrument made from a silicone hydrogel as described in any one of claim 13. 제16항에 있어서, 상기 의료 기구가 콘택트 렌즈, 인공 각막, 내시경, 카테터, 수액 튜브(transfusion tube), 기체 수송 튜브, 스텐트, 시스(sheath), 커프(cuff), 튜브 커넥터, 엑세스 포트, 배액 주머니(drainage bag), 혈액 회로(blood circuit), 상처 피복 재료, 또는 약제 담체인, 의료 기구. 17. The method of claim 16 wherein the medical device is a contact lens, artificial cornea, endoscope, catheter, infusion tube (transfusion tube), the gas transport tube, a stent, a sheath (sheath), the cuff (cuff), tube connector, the access port, drain pocket (drainage bag), blood circuit (blood circuit), a wound covering material, or the drug carrier, and medical instruments. 제1항 내지 제3항, 제5항, 제7항 내지 제9항 및 제13항 중 어느 한 항에 기재된 실리콘 하이드로젤로부터 제조된 안과용 렌즈. Claim 1 to claim 3, claim 5, claim 7 to claim 9, and ophthalmic lenses made from silicone hydrogel according to any one of the claim 13. 제1항 내지 제3항, 제5항, 제7항 내지 제9항 및 제13항 중 어느 한 항에 기재된 실리콘 하이드로젤로부터 제조된 콘택트 렌즈. Claim 1 to claim 3, claim 5, claim 7 to claim 9 and claim 13, the contact lenses made from silicone hydrogel according to any one of items. 제1항에 있어서, 상기 적어도 하나의 하이드록실기로 치환된 C1-20 알킬기가 적어도 하나의 하이드록실기로 치환된 C1-10 알킬기인, 실리콘 하이드로젤. The method of claim 1, wherein the C1-20 alkyl group substituted by at least one hydroxyl group of a C1-10 alkyl group substituted by at least one hydroxyl group, and silicon hydrogel. 제1항에 있어서, 상기 적어도 하나의 하이드록실기로 치환된 C1-20 알킬기가 적어도 하나의 하이드록실기로 치환된 C1-6 알킬기인, 실리콘 하이드로젤. The method of claim 1, wherein the C1-20 alkyl group substituted by at least one hydroxyl group in the C1-6 alkyl group substituted by at least one hydroxyl group, and silicon hydrogel. MX2013003905A (en) * 2010-10-06 2013-06-03 Novartis Ag Water-processable silicone-containing prepolymers and uses thereof. ES2328009T3 (en) 2009-11-06 Soft contact lens capable of being used long term.